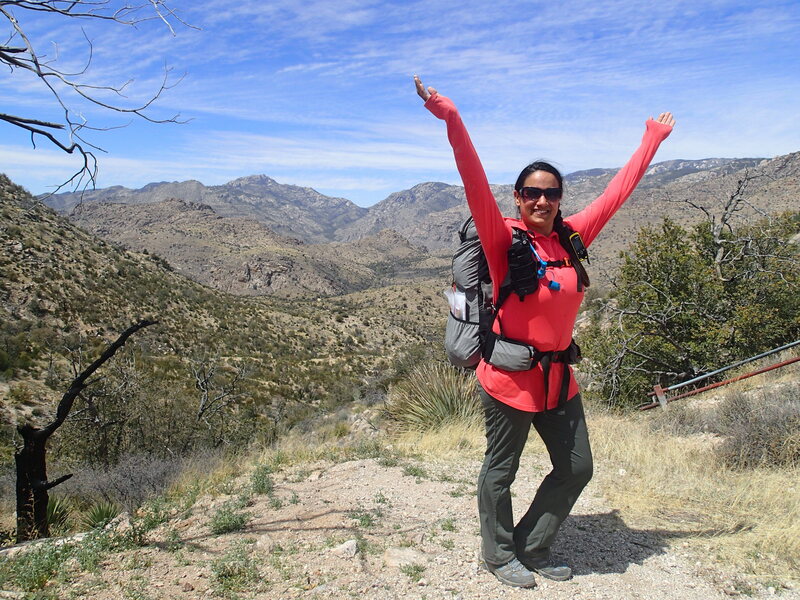 I was unable to attend any of the AZT Trek hikes and events since Sirena started her epic journey on March 14, so I was elated when she invited me to join her and Wendy as she trekked the Oracle Ridge portion of Passage 12 last Saturday. 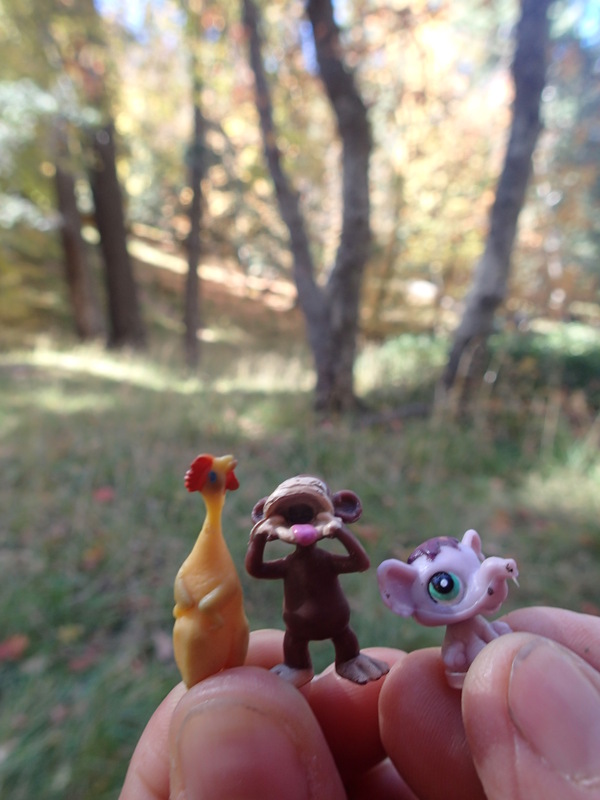 The three of us have had some memorable hikes in the past, including Frog Hollow and Elephant Head, so I knew this would be another great outing. 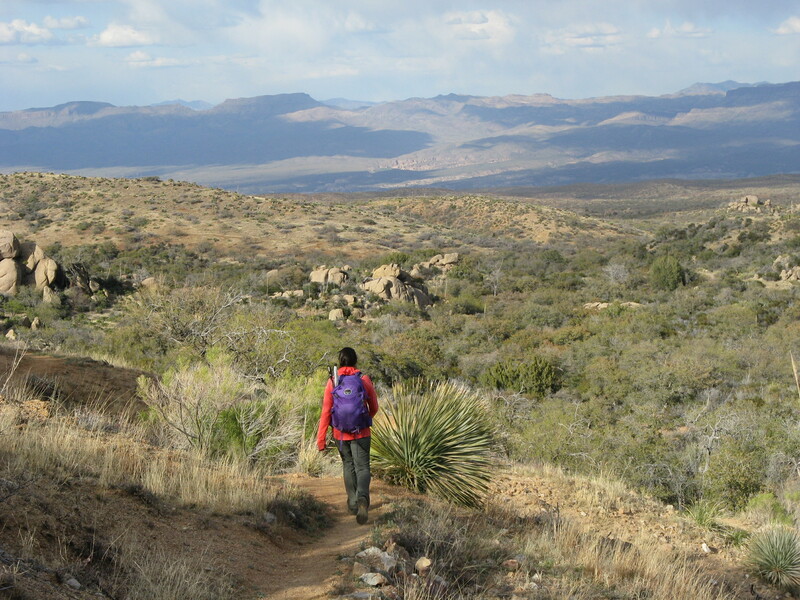 The hardest part about day-hiking sections of the Arizona Trail in a one-way direction is logistics and Oracle Ridge was no exception. 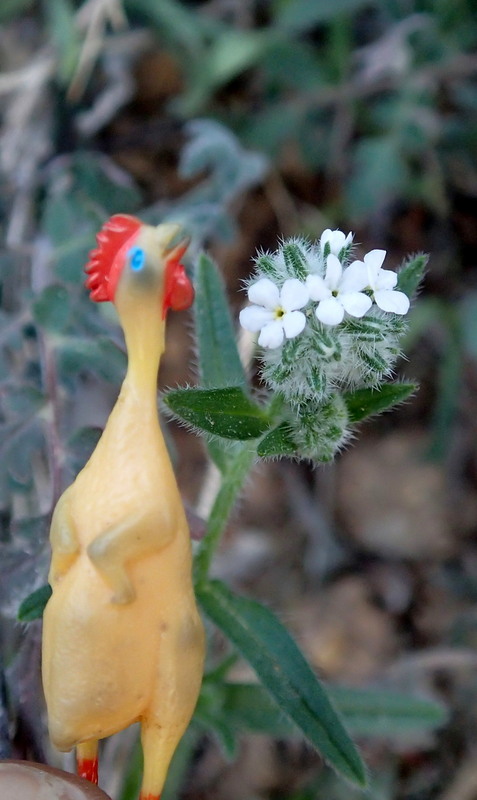 Sirena had spent the night on Mt. Lemmon in Summerhaven so she was set to go. On the other hand Wendy and I were coming from afar and met up at the American Flag Trailhead at 6:30am after leaving our respective homes at 0-dark-hundred. We left Wendy’s truck at American Flag and shuttled in my vehicle up Mt. Lemmon via the Oracle Control Road (FR38). 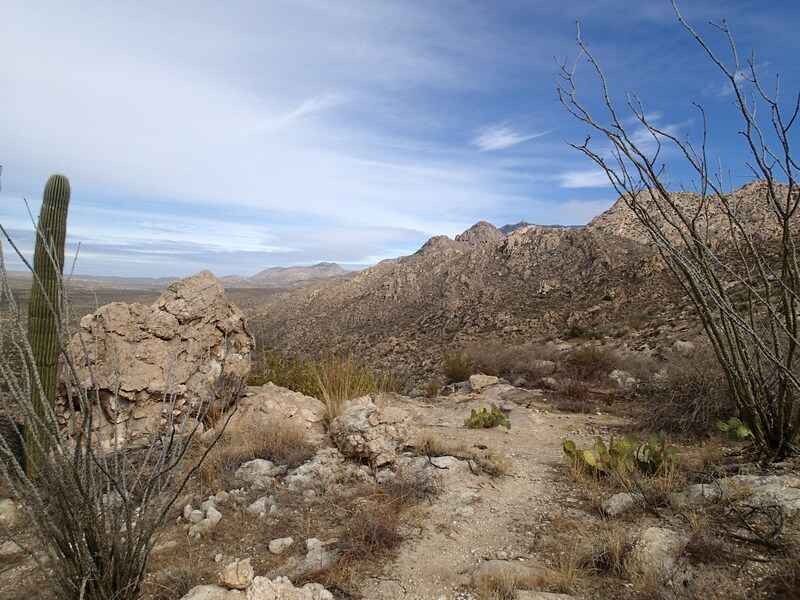 Although the Control Road was only about 25 miles in length its twisty, rocky unpaved route took nearly two hours. Fortunately FR38 was Subaru-friendly. 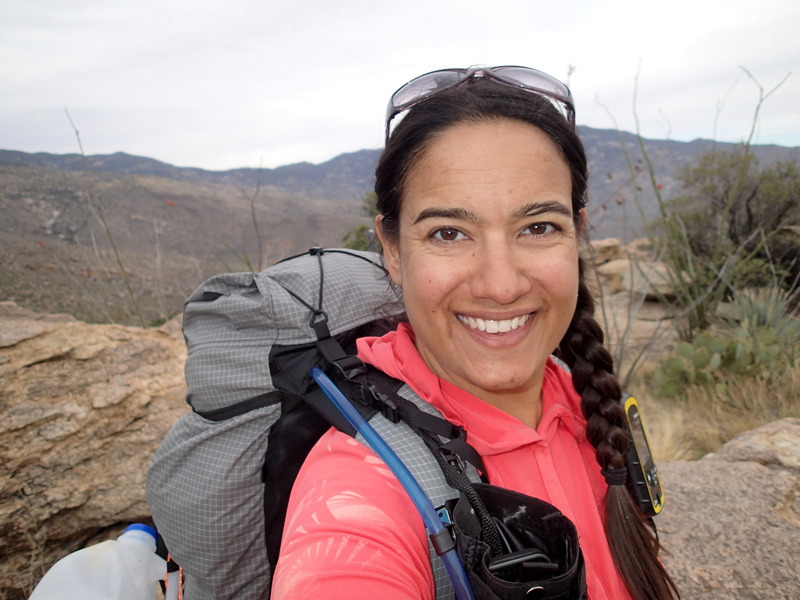 Upon reaching Summerhaven we picked up Sirena and drove back down the Control Road a short distance to the Oracle Ridge Trailhead where we began our 13.2 mile Arizona Trail Trek. As we began our hike at 8:45am the air temperature on Mt. 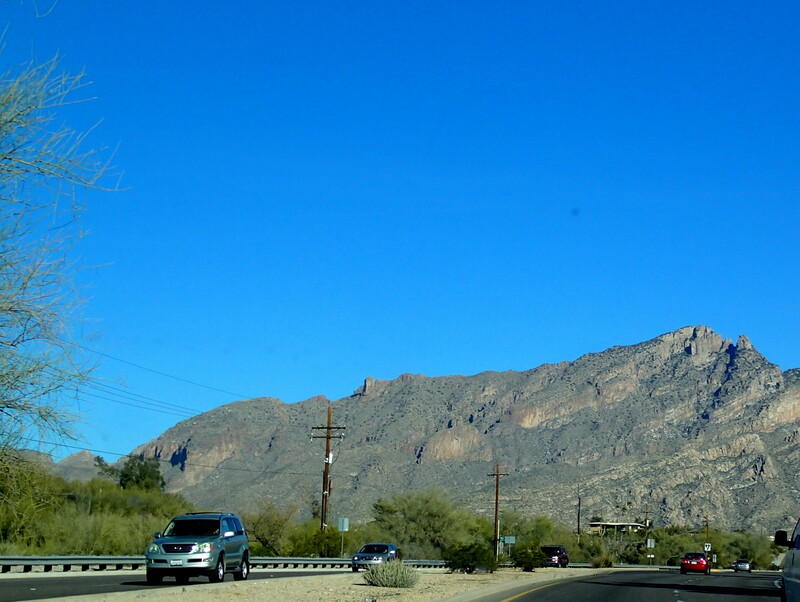 Lemmon was in the mid 30’s under a clear, sunny sky. It wasn’t long before we had an impressive view down Oracle Ridge along which we would spend most of the day. 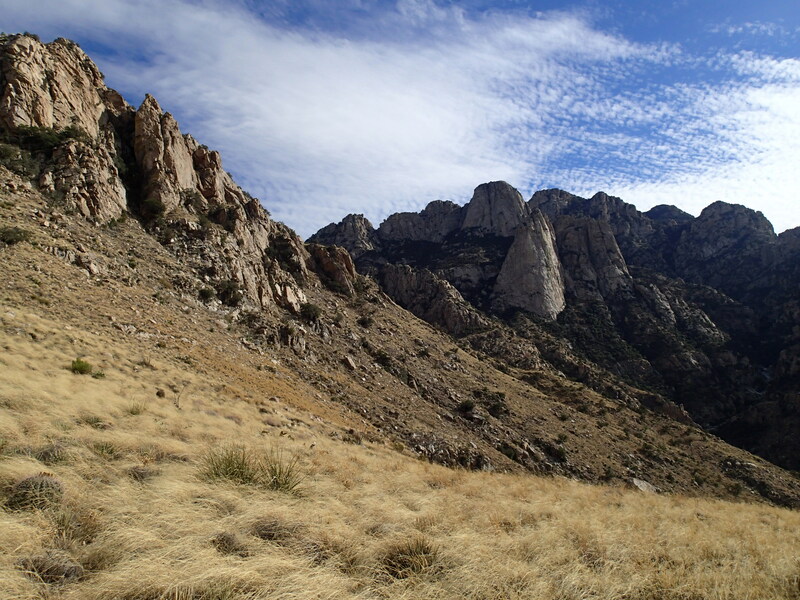 Some of the “bumps” along Oracle Ridge include Marble, Rice, and Apache Peaks. 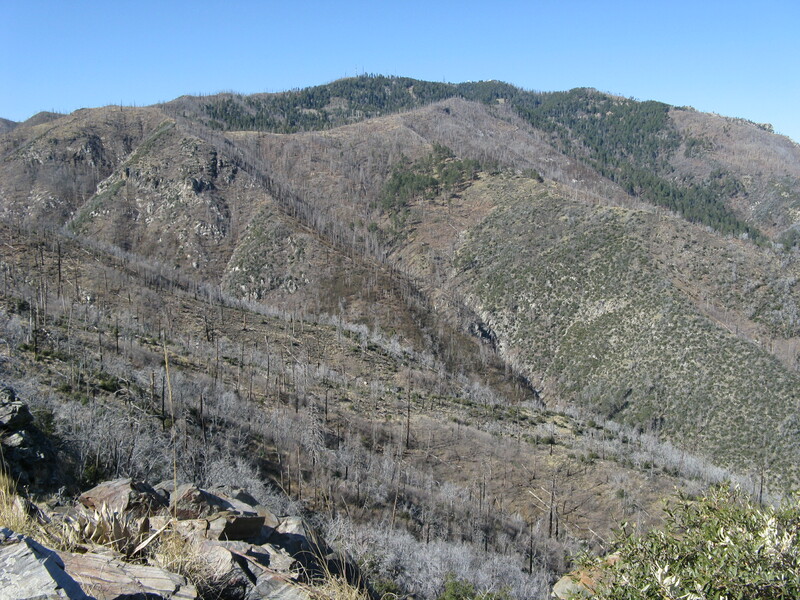 Most of Oracle Ridge is still recovering from wildfire over a decade ago. 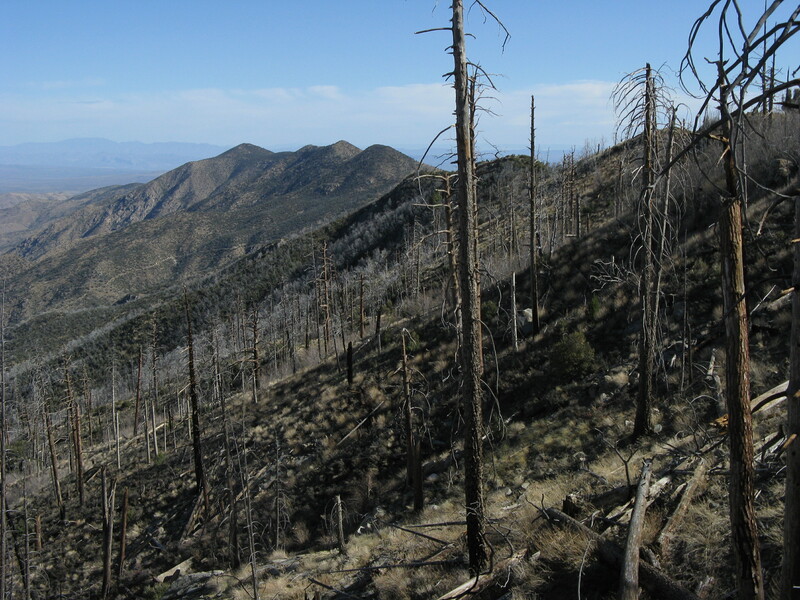 We wondered if it had been the 2002 Bullock Fire or the 2003 Aspen Fire that had torched the ridge, or perhaps both. 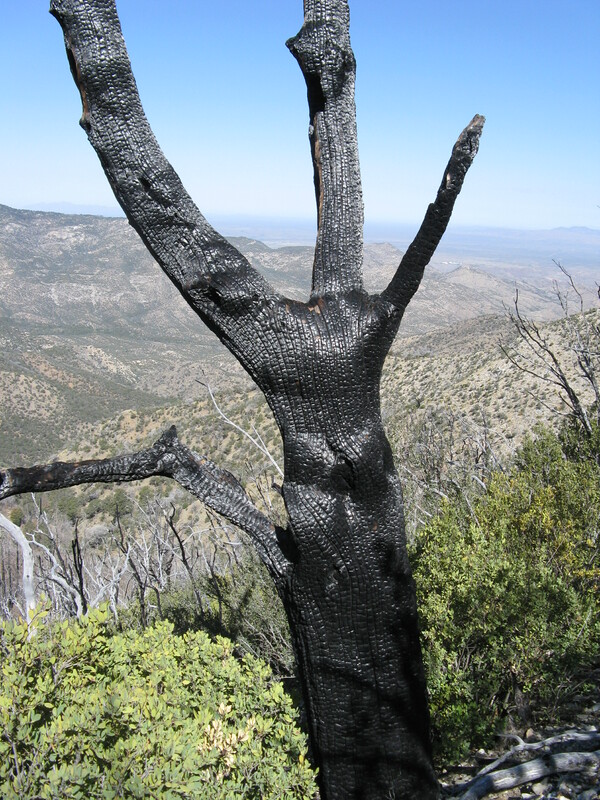 There were many charred trees still standing tall among new vegetation. Looking back toward Mt. Lemmon you can see the vastness of the burn. 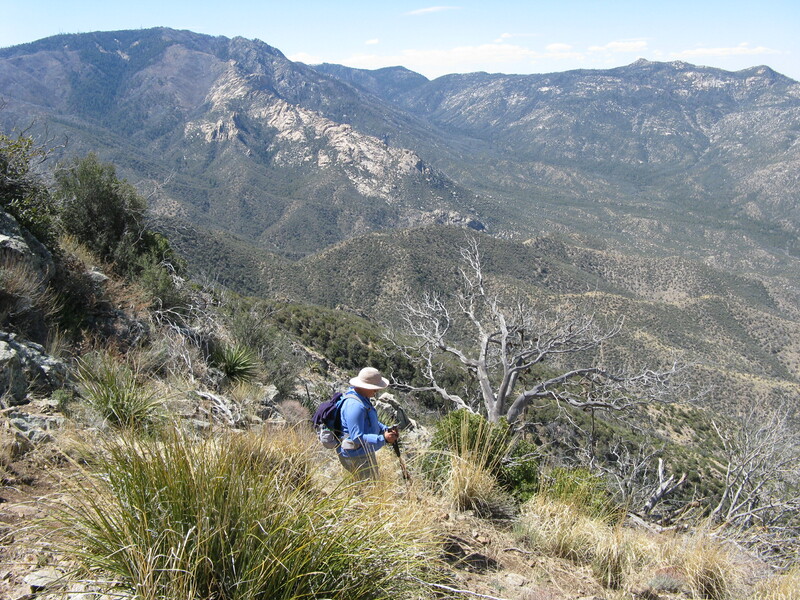 The awesome views from the AZT on Oracle Ridge are a big benefit of the fire. Off to the east were the Galiuros and Mt. Graham. 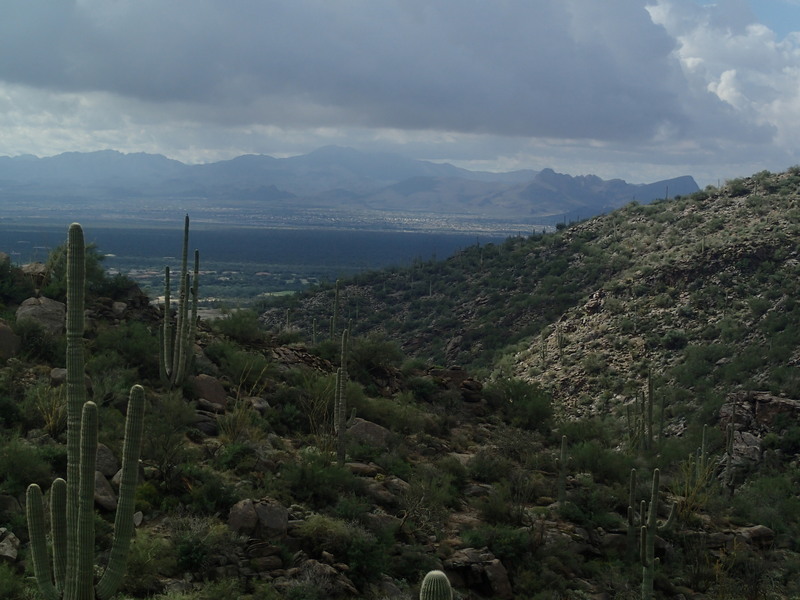 We could see as far north as Four Peaks, Weavers Needle, and the Superstitions. 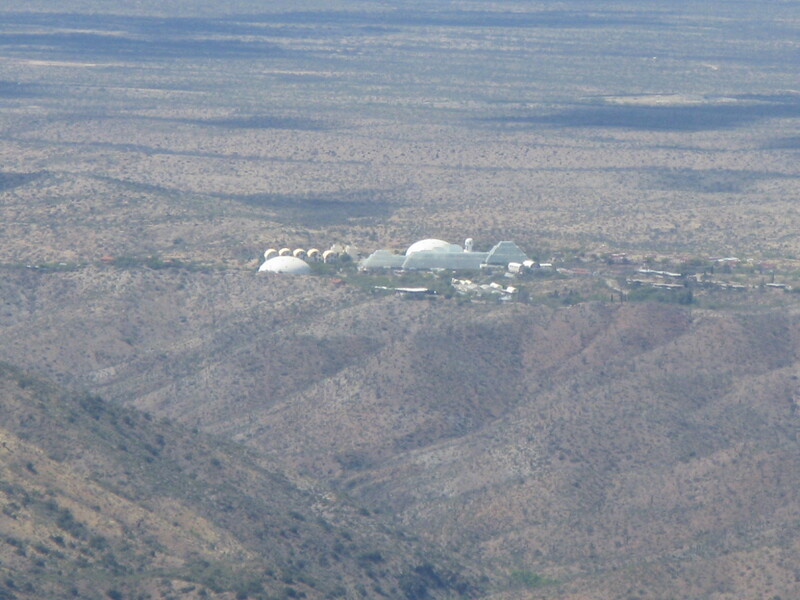 Closer in the Biosphere domes were visible. Before we knew it we were at Dan Saddle and a little further down the trail we had a nice view of Marble Peak which we had skirted earlier. 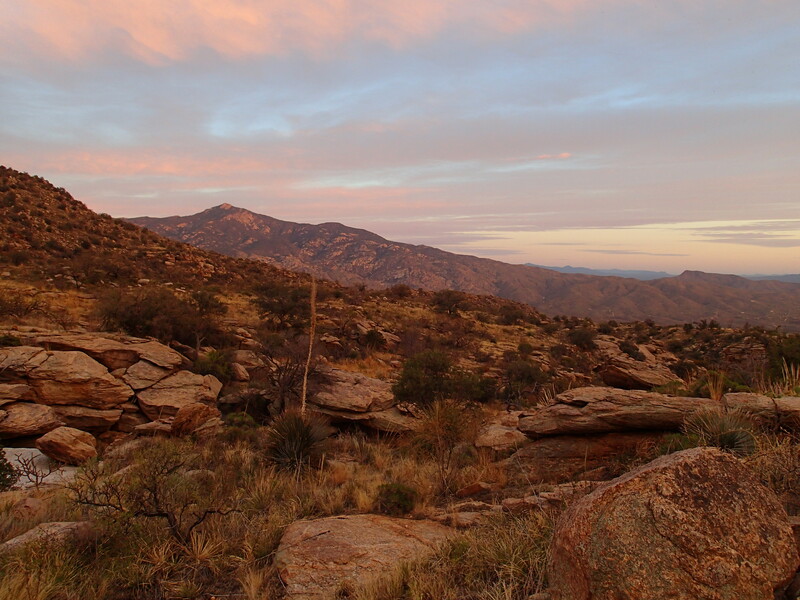 There are so many amazing views along the Oracle Ridge portion of the Arizona Trail that it would be hard to pick a favorite. 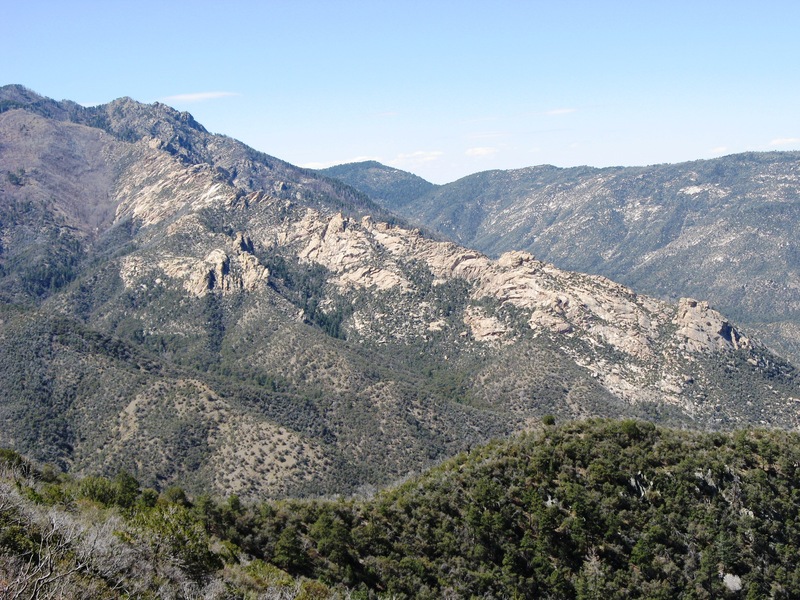 However, there probably isn’t a better view of the Reef of Rock anywhere else in the Santa Catalina Mountains. 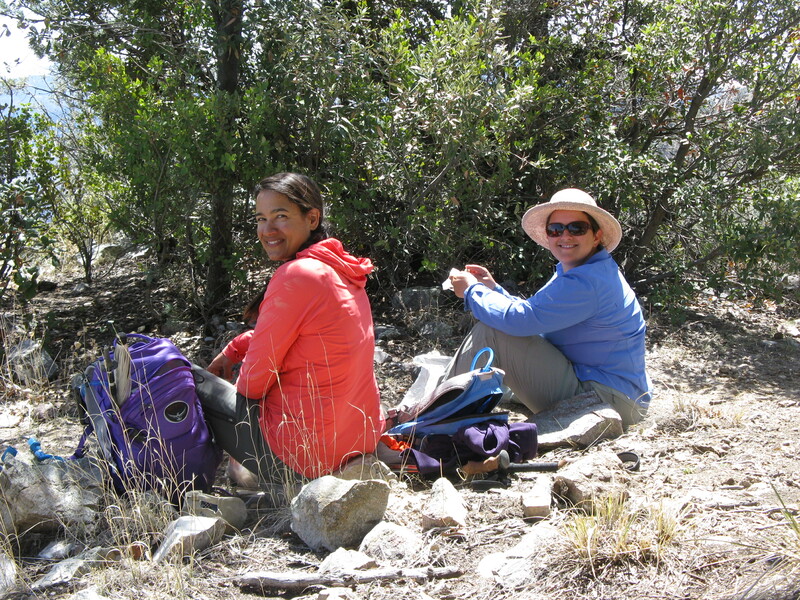 Sirena and Wendy pointed out Canada del Oro, behind Reef of Rock, as they reminisced about backpacking in the past. 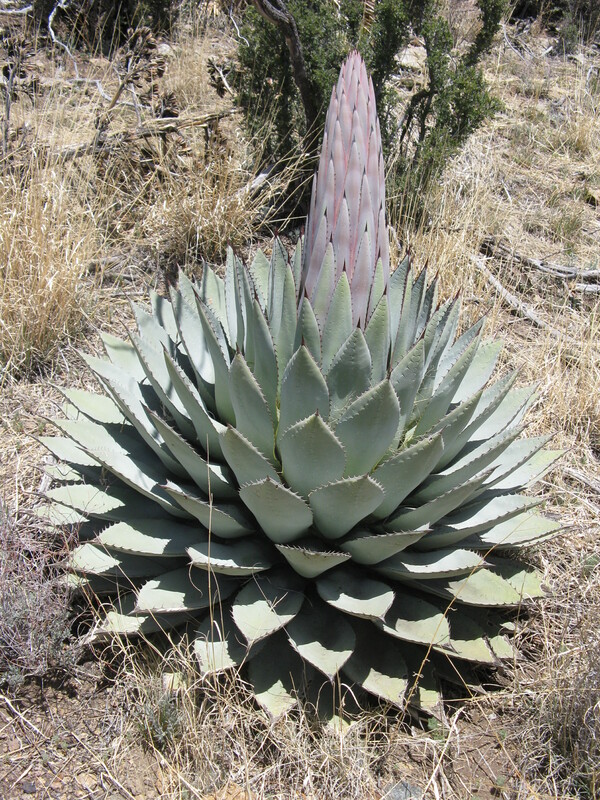 As we trekked along the AZT we observed impressive specimens of agave and hedgehog cacti. 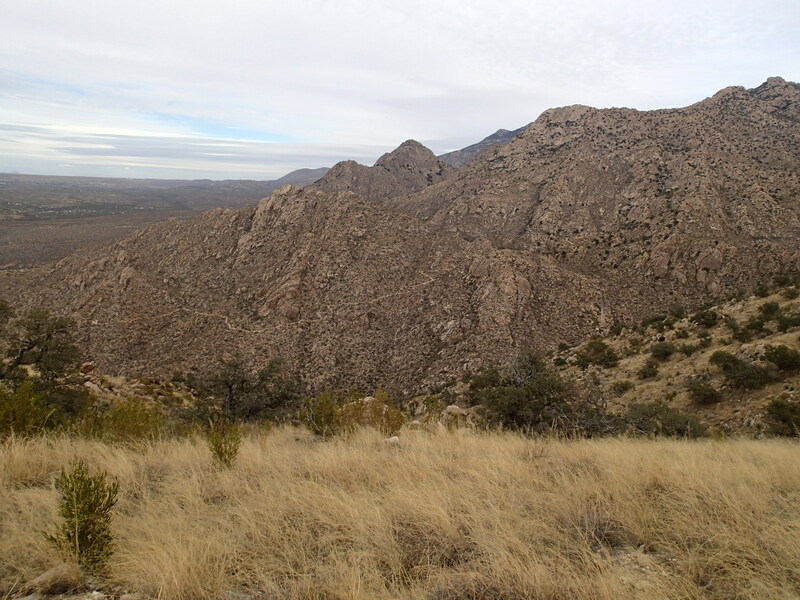 After several hours into our hike we paused for a snack break along the trail where we enjoyed a grand view across the San Pedro River Valley toward the Galiuros and Mt. Graham. 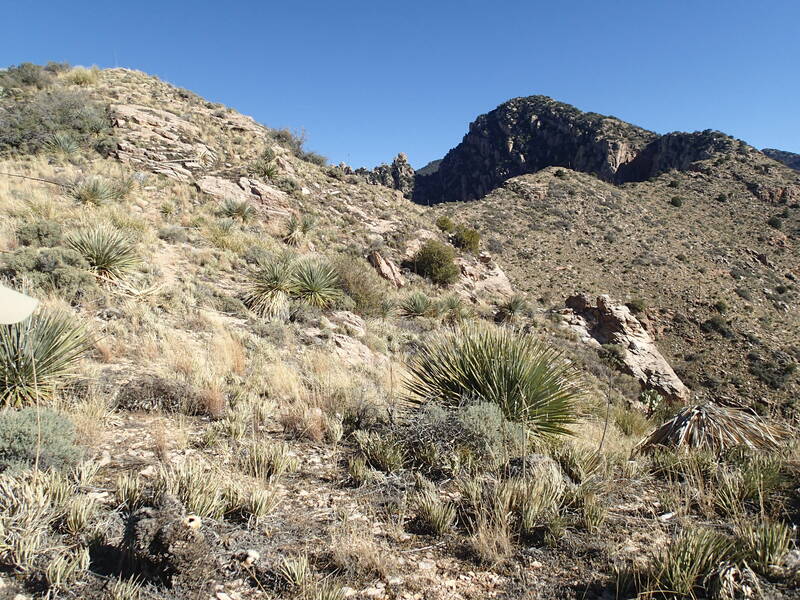 On the Oracle Ridge section of Passage 12 the Arizona Trail follows the Oracle Ridge Trail for 10.3 miles and the Cody Trail for 2.9 miles. 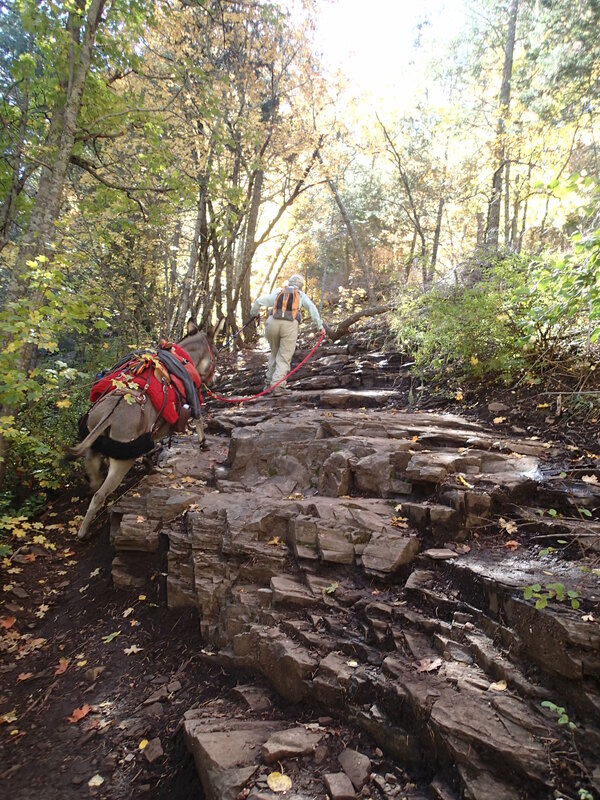 Although the entire 13.2 mile section is in good shape and easy to follow the lower portion of the Oracle Ridge Trail and the entire Cody Trail had some recent tread work and were in super shape. 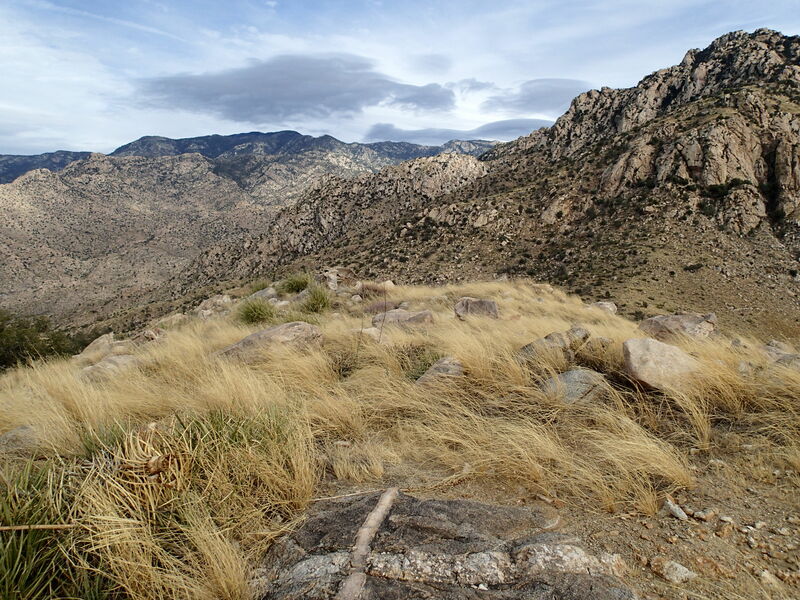 Along the Cody Trail the AZT winds through a scenic Texas Canyon-like boulder field. 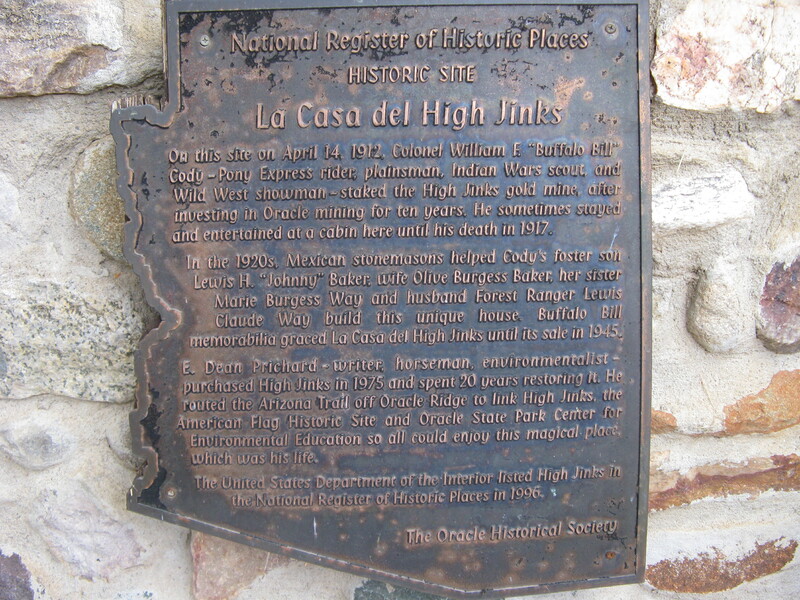 A big highlight of this outing came late in the hike when we made a very short detour from the AZT/Cody Trail to High Jinks Ranch which is a National Historic Site once inhabited by “Buffalo Bill” Cody. 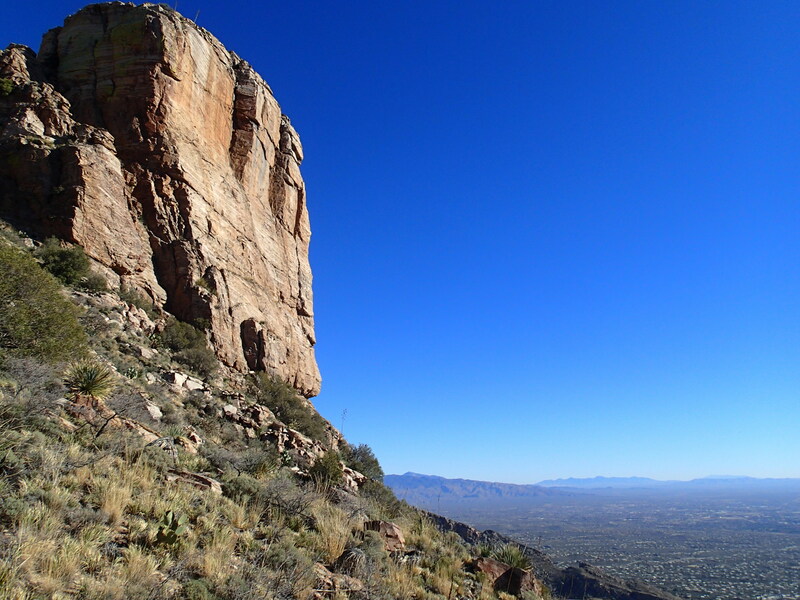 Nothing like a little bit of history to go along with a hike on the Arizona Trail! Current owners Dan and Laurel invited us in for a visit as their dogs welcomed us from a rooftop lookout. 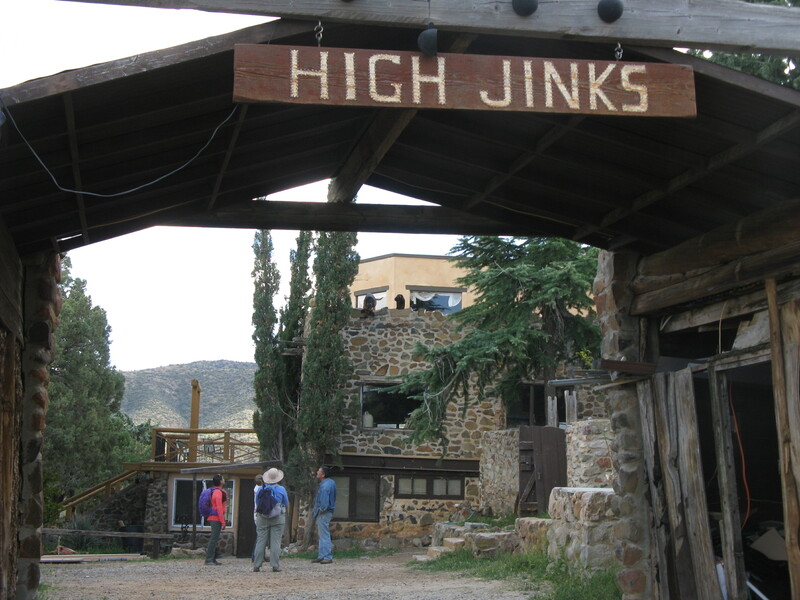 High Jinks Ranch is a pretty cool place and even has a hot tub and its own Arizona Trail portal. From High Jinks Ranch it was a short but scenic 1.6 mile hike to the American Flag Trailhead which was our final destination for the day. 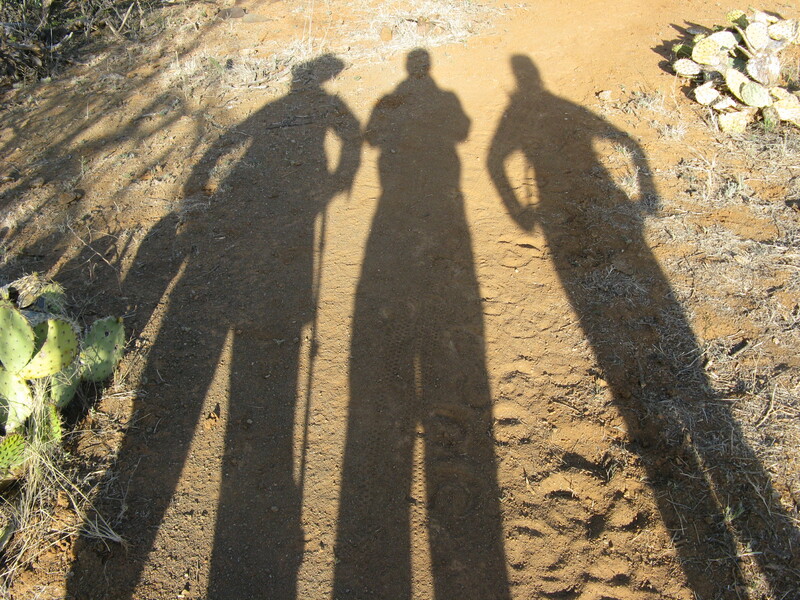 The sun was casting long shadows as we reached the 200 mile mark of Sirena’s Arizona Trail Trek. 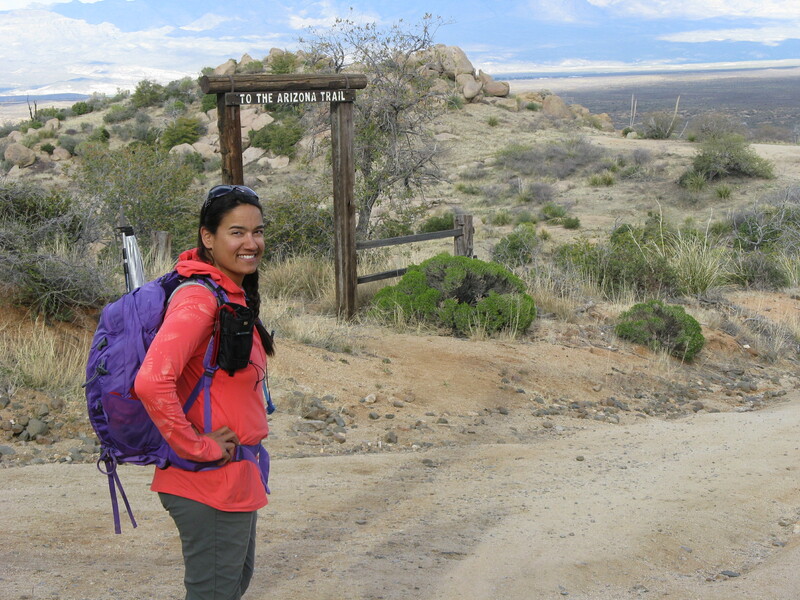 Upon arrival at the American Flag Trailhead Sirena posed with an limited edition AZT Trek bandana. 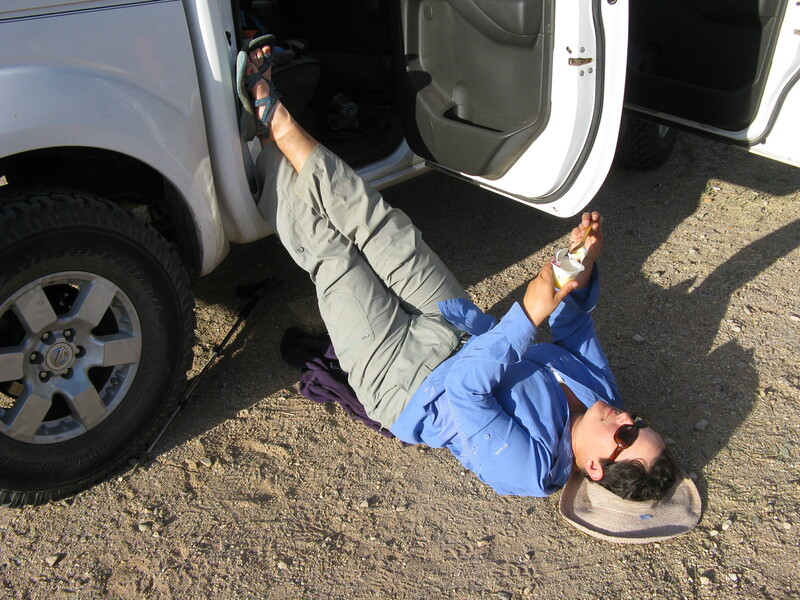 Meanwhile Wendy unwound after a memorable AZT Trek before making the long drive back up the Oracle Control Road to my car near Summerhaven. 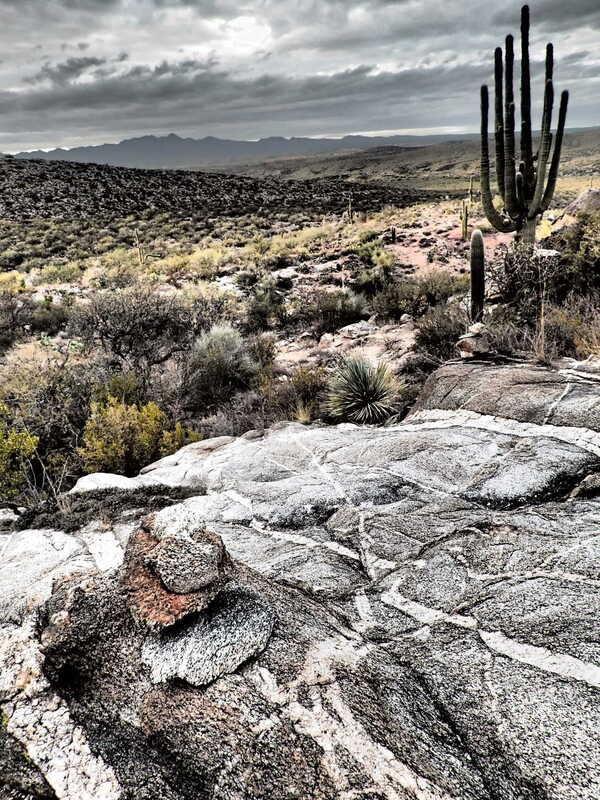 The Arizona Trail Trek is an 800-mile thru-hike across Arizona to promote the Arizona National Scenic Trail, the Gateway Communities and the new official AZT guidebook. 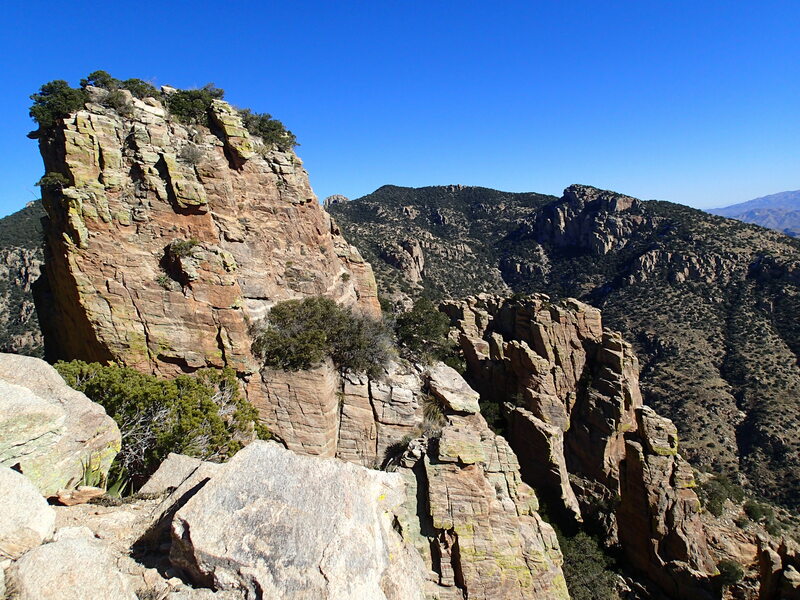 In addition, the AZT Trek is using an Indiegogo crowdfunding campaign with unique and exclusive incentives to raise $20,000 for the Arizona Trail Association to maintain, protect, and promote the Arizona Trail. So far almost $2,500 has been raised. I made a contribution and challenge YOU to do the same. If nothing else check out the great video by Matt and Sirena and browse the unique and exclusive incentives. 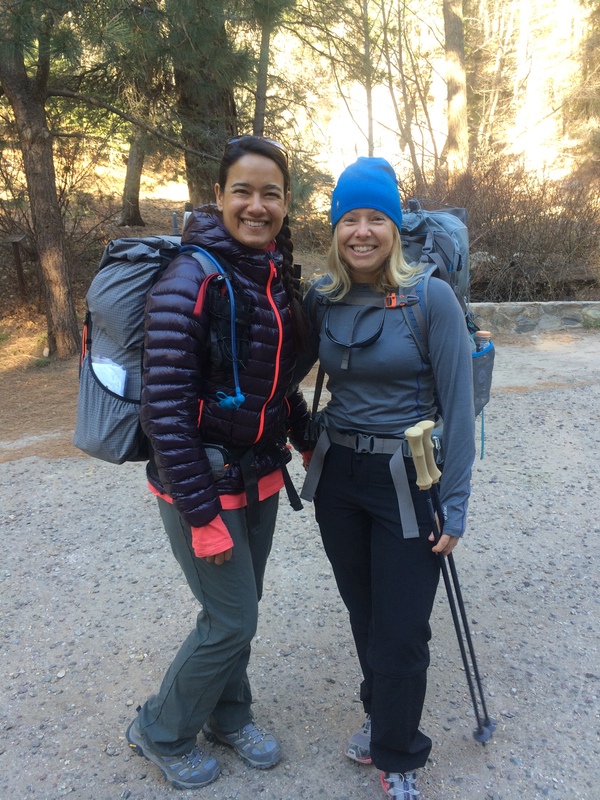 It was an honor and pleasure to hike along with Sirena (and Wendy) for a small portion of her 800+ mile Arizona Trail Trek and to be a guest blogger on Sirena’s Wanderings. 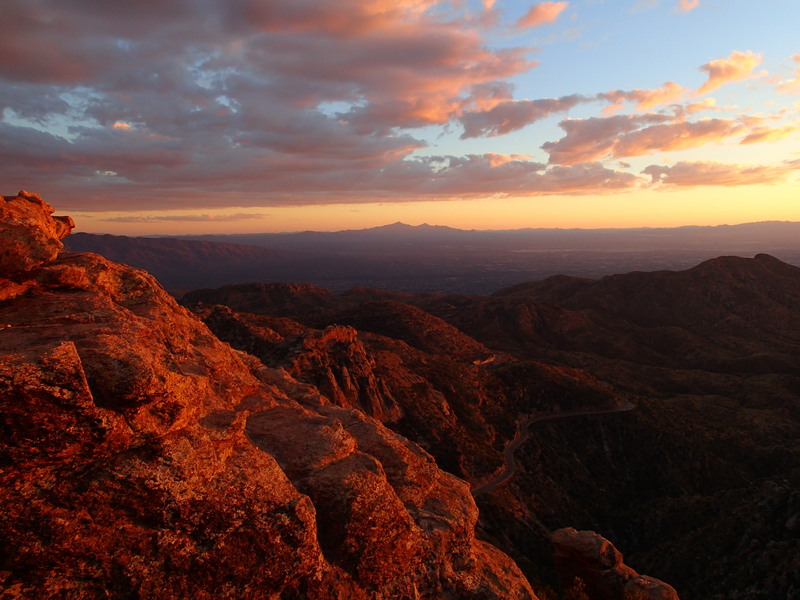 Have you checked out the Indiegogo crowdfunding campaign to raise $20,000 for the Arizona Trail Association yet? 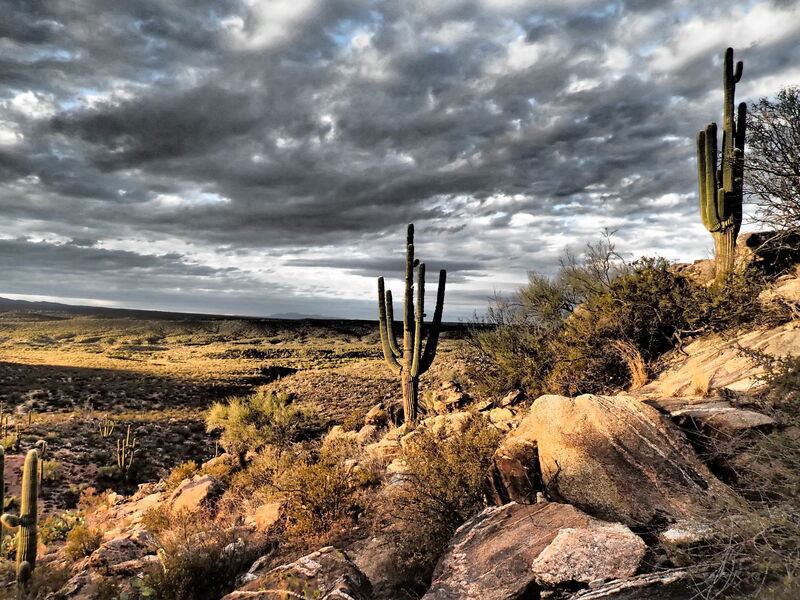 We’ve got all sorts of fantastic incentives from Arizona Trail pint glasses to signed art prints and one-of-a-kind experiences. 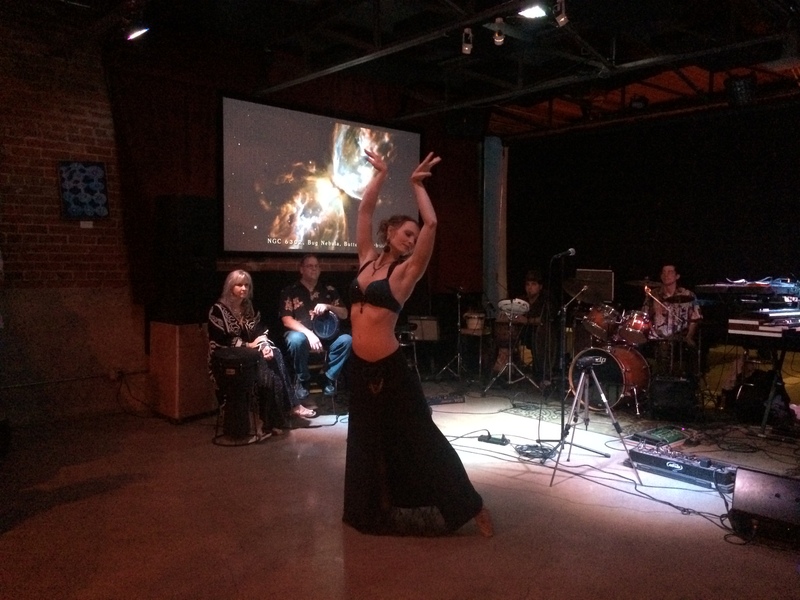 Launched on March 28th with a big belly dance kickoff event at Sky Bar Tucson, over $2,000 has been raised in the first week of the campaign! 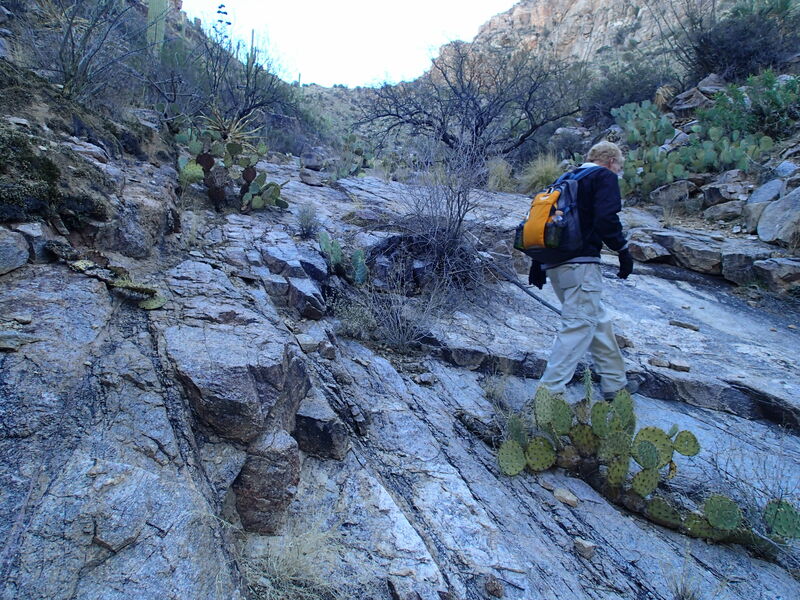 The next day after a fantastic evening of dance and music, the next stop for the Arizona Trail Trek was Arizona Trail Day at Colossal Cave east of Tucson. 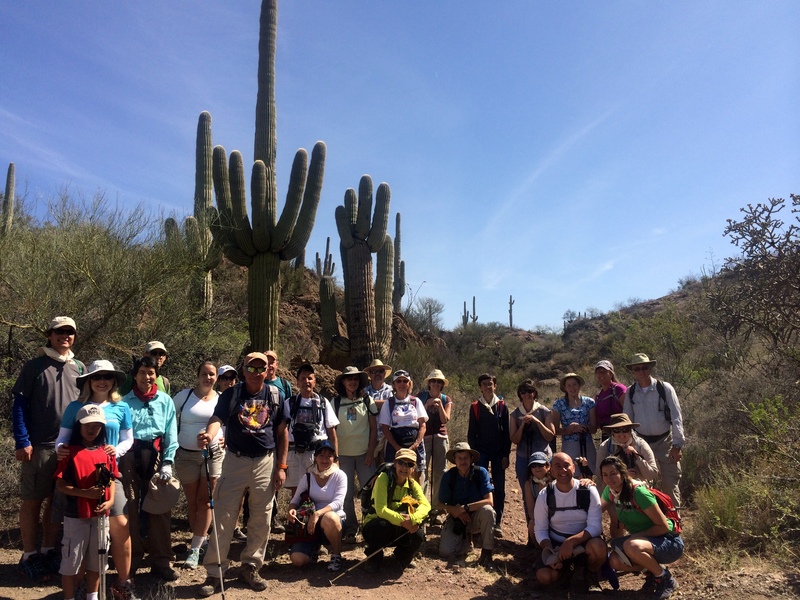 I led a large group of folks on a hike from Gabe Zimmerman Trailhead to Posta Quemada Ranch at Colossal Cave Mountain Park. There was also a guided bike ride and a horseback ride as well. We all came together at the ranch for lunch and afternoon activities, including a visit from the birds at Wildlife Rehabilitation Northwest Tucson. In the evening, the fun moved to the La Sevilla Campground, where we ate delicious food courtesy of It’s Greek to Me and listened to the music of Eb’s Camp Cookin’ around the campfire. 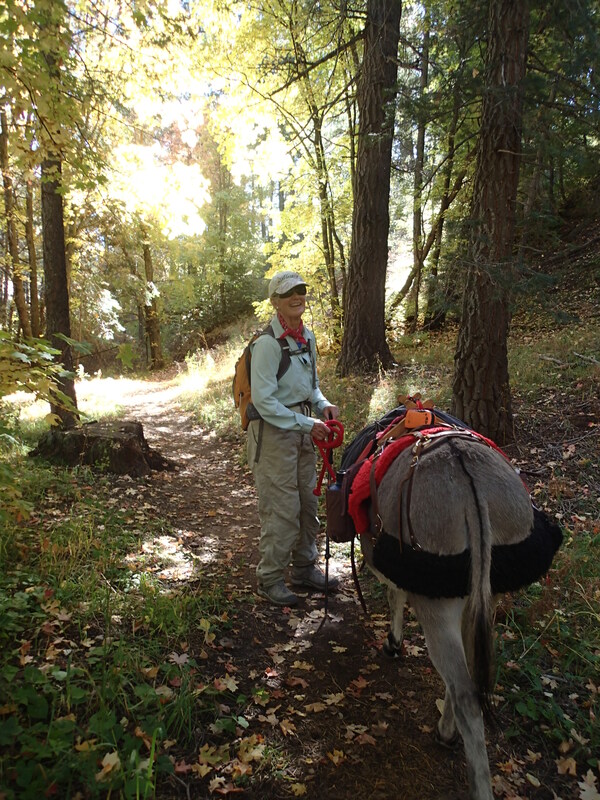 Terry, who is riding the whole trail with two horses and two dogs, was part of the festivities as well. 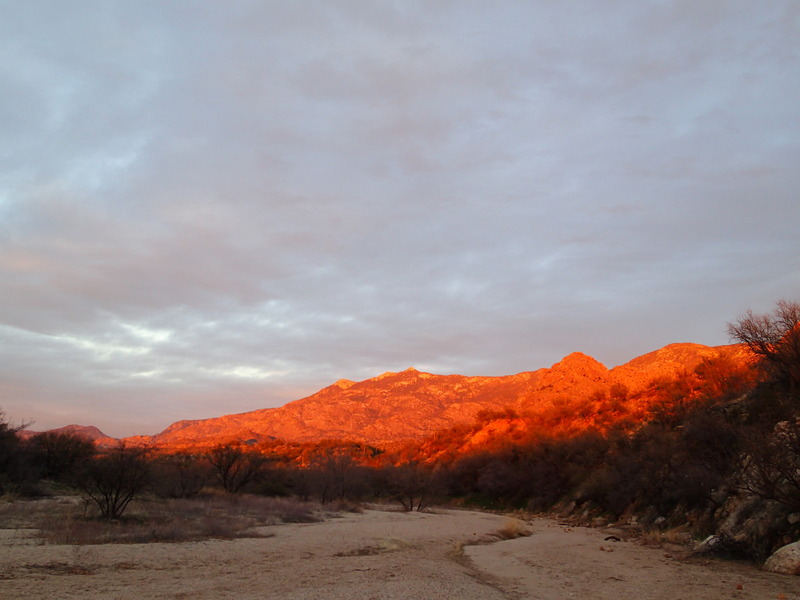 In the morning, I was excited to be hiking up into the Rincons. 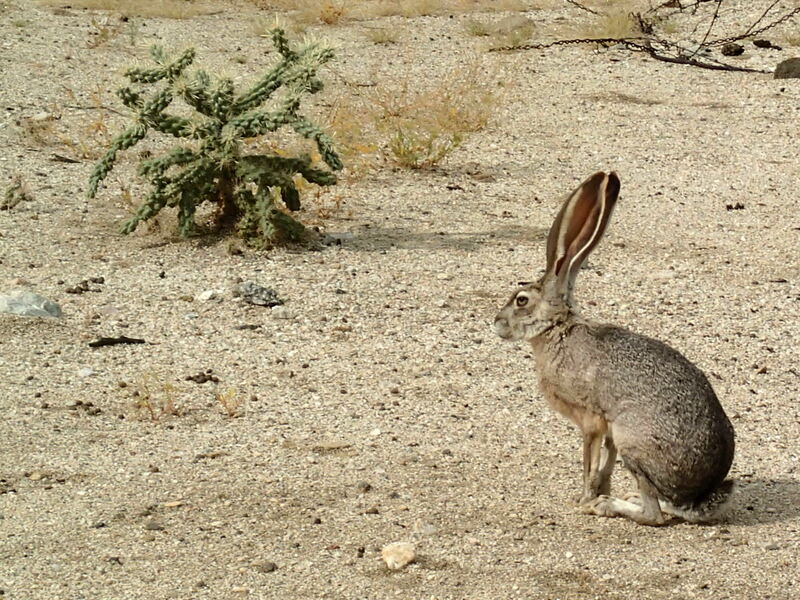 Though they are just east of Tucson, I don’t get into them nearly as much as I would like. 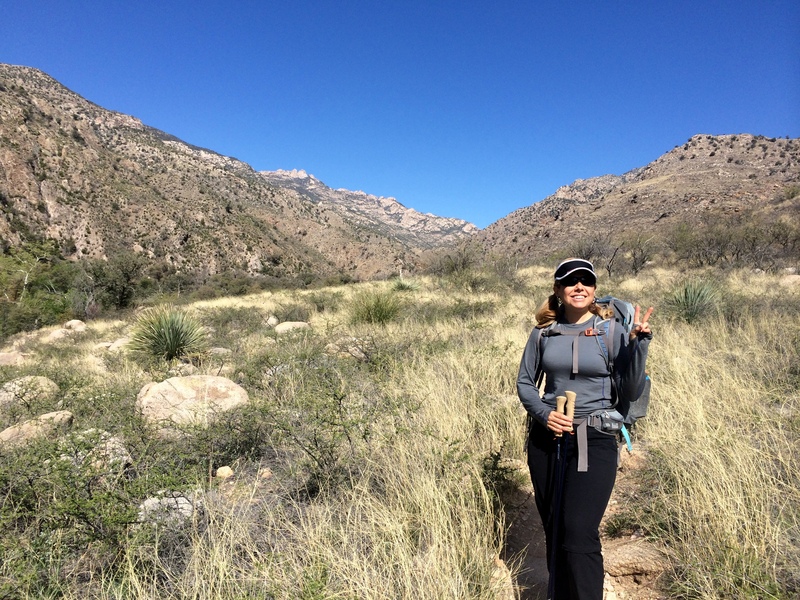 I hiked the rest of the winding Rincon Valley passage, passing many mountain bikers out on a beautiful Sunday, many who I knew or who recognized me. 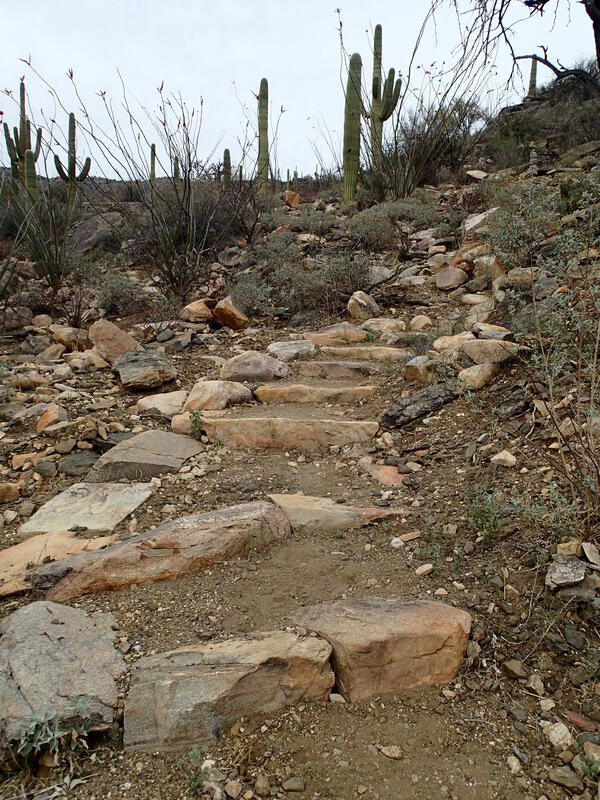 I reached the Quilter Trail intersection and recalled fond memories of work trips in Saguaro National Park to build this connector trail. 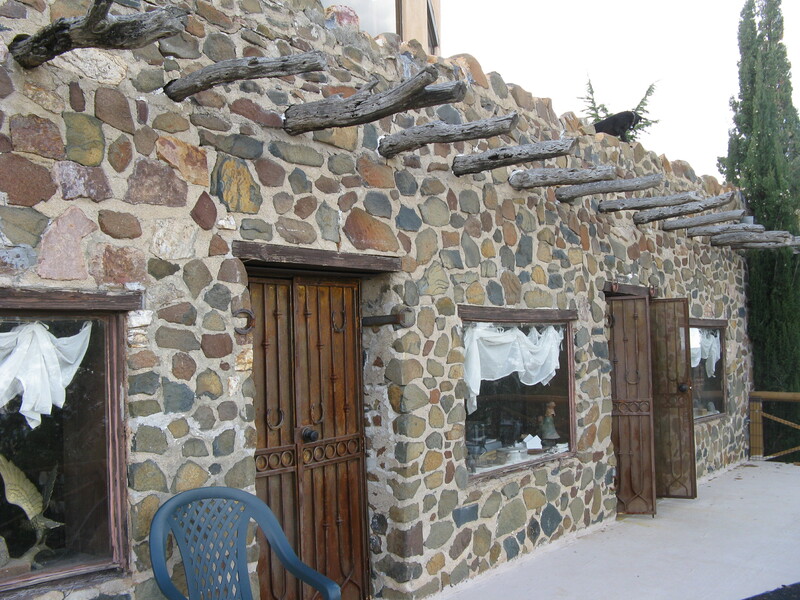 It has some of the fanciest rockwork ever. It was a long day, and after taking in the sunset near some attractive pools of water, I continued on to Grass Shack Campground. The next day was a big climb to Manning Camp at 8000 ft. 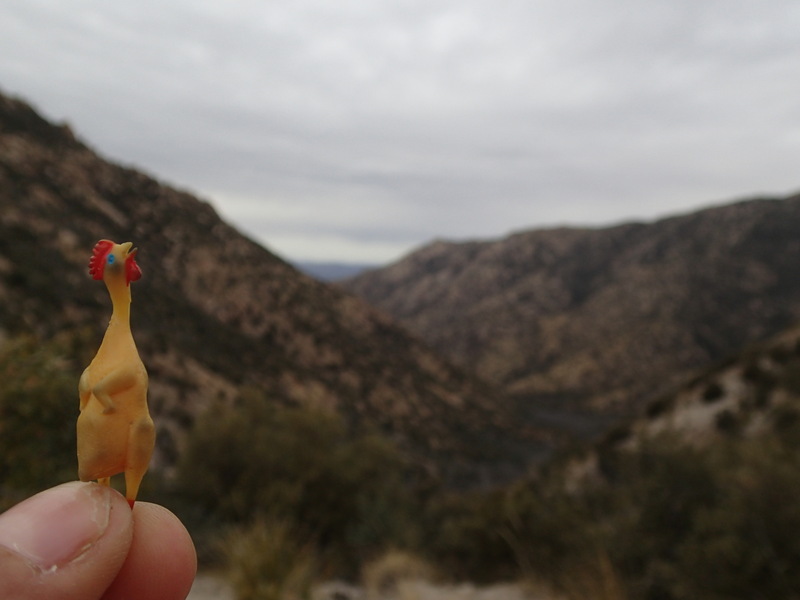 I made an enjoyable day of it, taking frequent breaks to snack or take in the view. I had a long lunch with an exquisite nap under a tree. 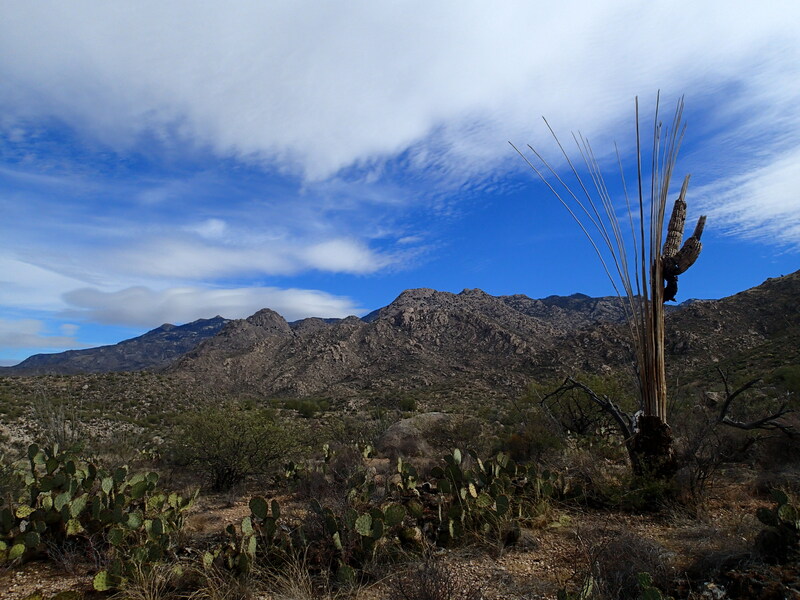 The Sky Islands are incredibly diverse- in just two days I’d gone from Saguaros to Ponderosa Pines. 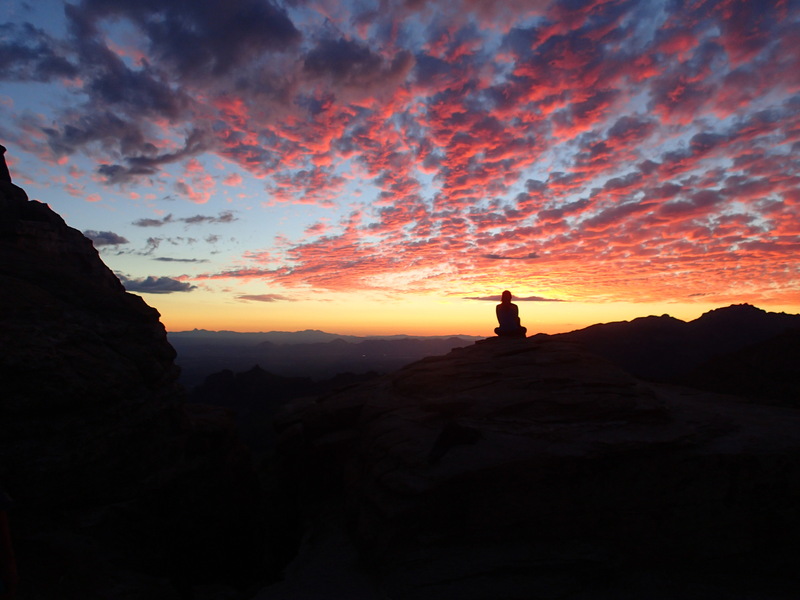 Met back up with Pops and Bars as well as two section-hikers Maverick and El Tractor for sunset-watching and an evening by the campfire. So cold but so good!! 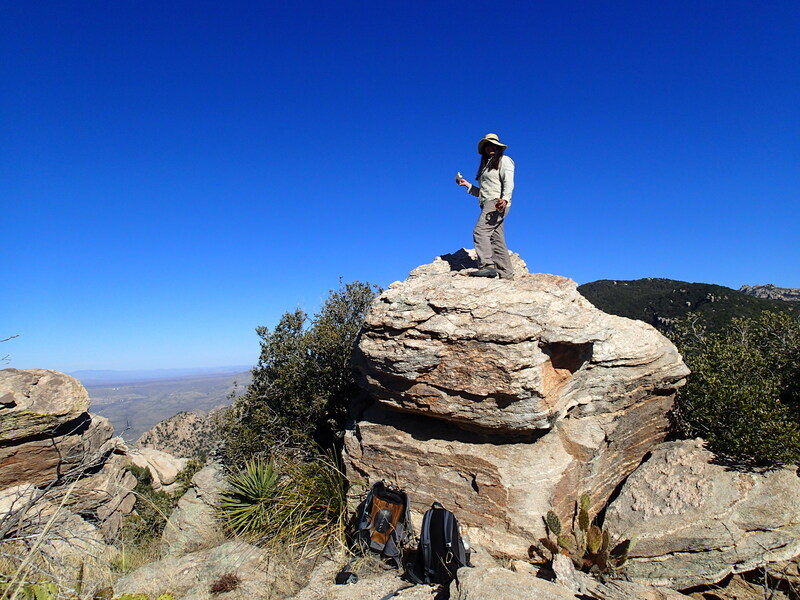 The next day was one of my favorites of the whole trip so far- the views from the north side of the Rincons are spectacular with fantastic rock formations. The descent was steep but the trail was better than the last time I’d done it in 2008. 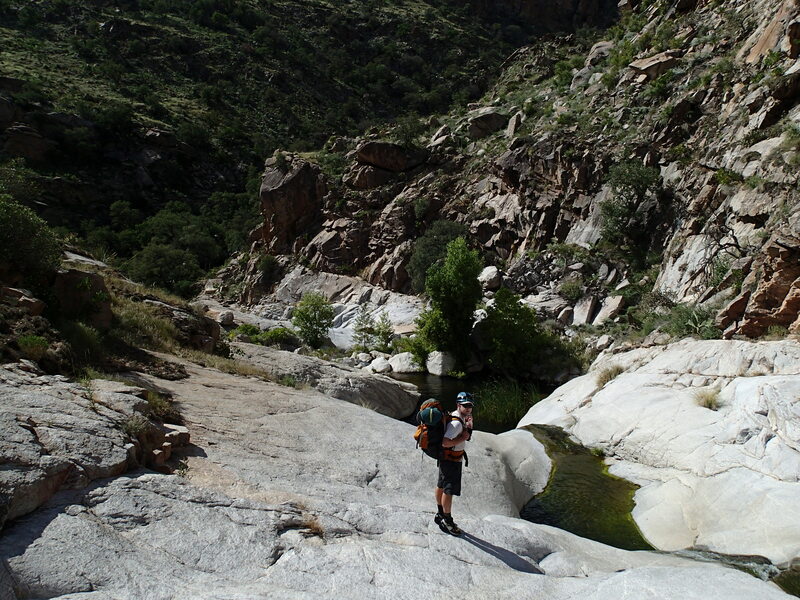 I reached the cool pools of Tanque Verde Creek and dropped my pack and relaxed by the creek for hours. I saw no one all day. 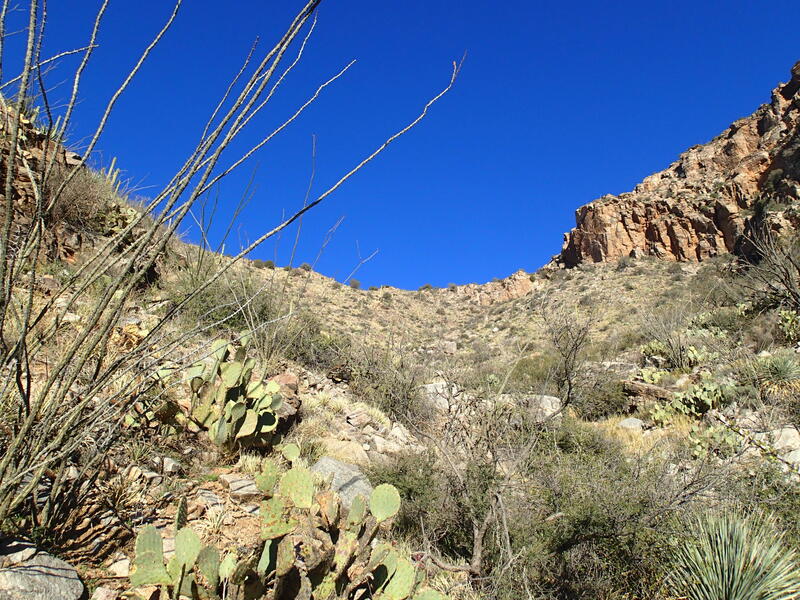 I hiked on to where the Arizona Trail crosses Redington Road and manged to find a spot that was free of both bullet casings and broken glass, no small feat in this area. 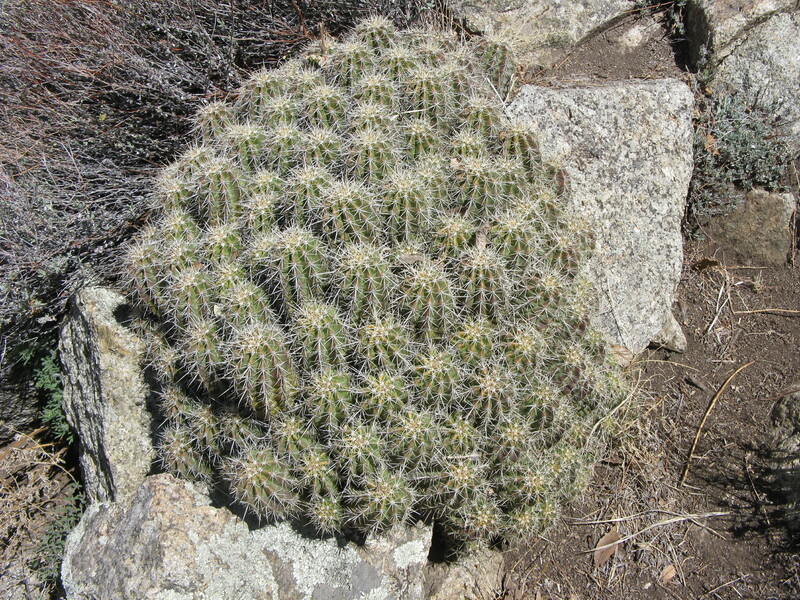 It had been windy for days upon end, to be expected of springtime in Arizona, but still mildly unpleasant. 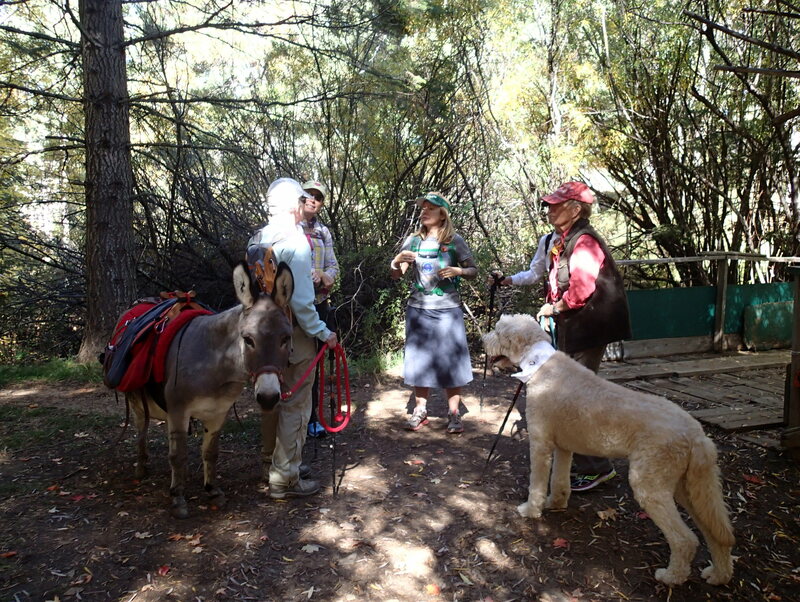 The next morning I was met by my friends Laddie and Sue Cox, who brought me a resupply box for my next piece through the Catalinas. Great to see friendly faces, they are legends that have helped the Arizona Trail Association in many ways through the years. Laddie and I used to be on the same volunteer trail crew, the Crazies. 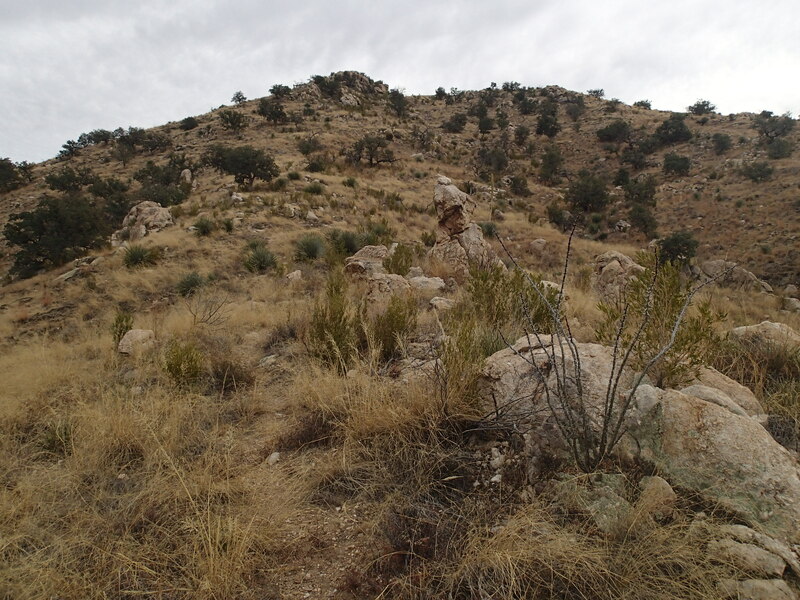 After repacking, I hiked through attractive juniper-dotted hills toward The Lake and then on toward West Spring. I kept an eye out for Kean Brown’s retired horses and was not disappointed. 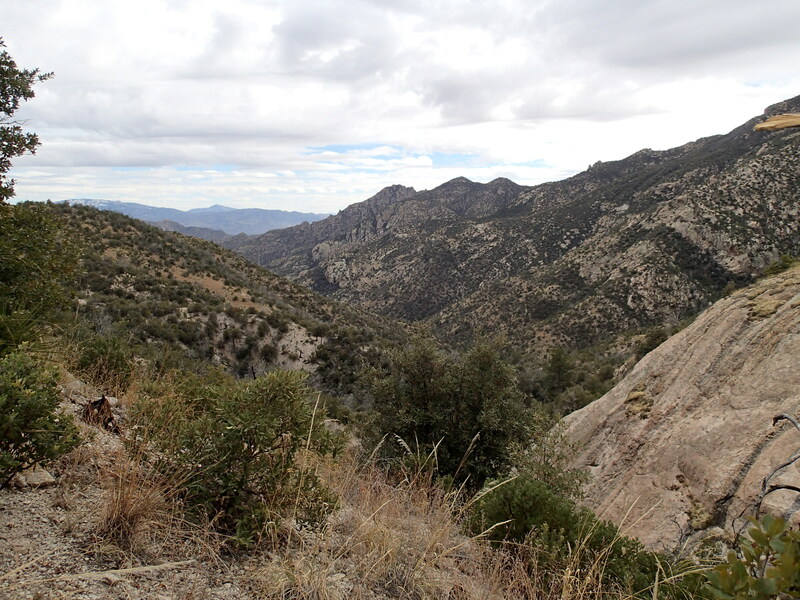 I spent a while visiting with the four horses near West Spring and then made the ascent to the saddle above Molino Basin and then down the other side to the campground. I know this piece of trail like the back of my hand, it used to be my go-to hike long ago when I was recovering from fibromyalgia. What a great thing to have the strength now to have walked here from Mexico. It was still windy and I got an idea in my head that I would love a hot shower. 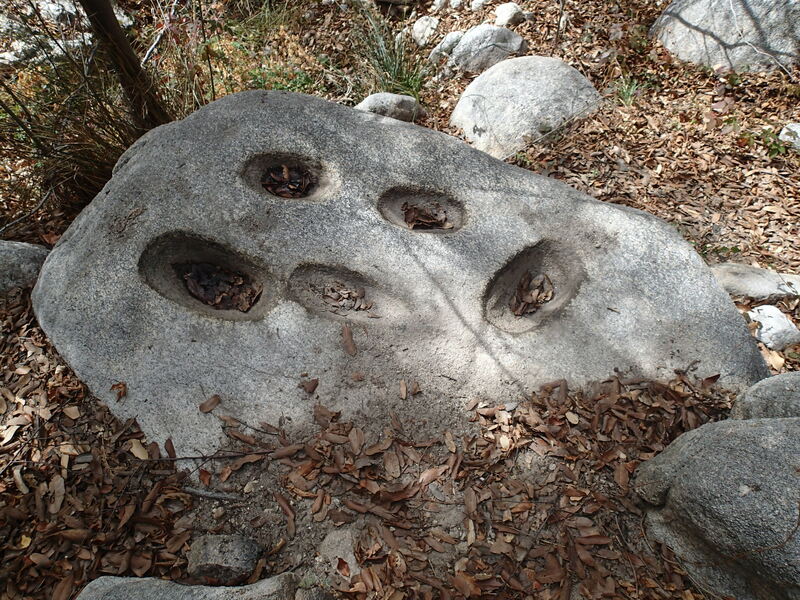 I have a friend, Tom- another of the Crazies, that lives right at the base of the Catalinas, and so I called and he and his wife Nancy were available to meet me at Gordon Hirabayashi (Prison Camp) Trailhead. Not only did I get my coveted shower, but also an invite to stay the night and dinner on top of it all! It was such a nice surprise. The next morning Tom took me back to where he’d met me and we picked up another woman, India, for the next leg of the hike. 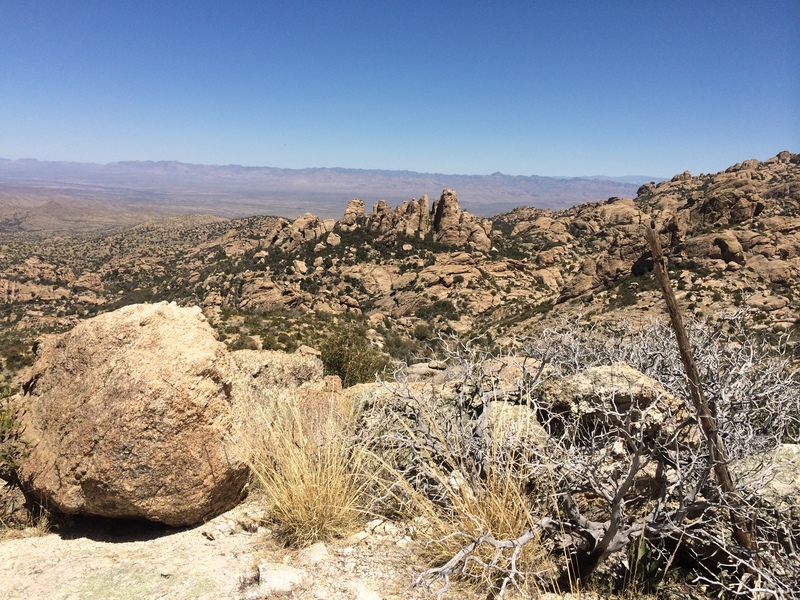 Instead of hiking uphill, Tom offered to drive us up to the top of Mount Lemmon so that we could hike the next piece downhill instead. I didn’t have to think twice about that one! 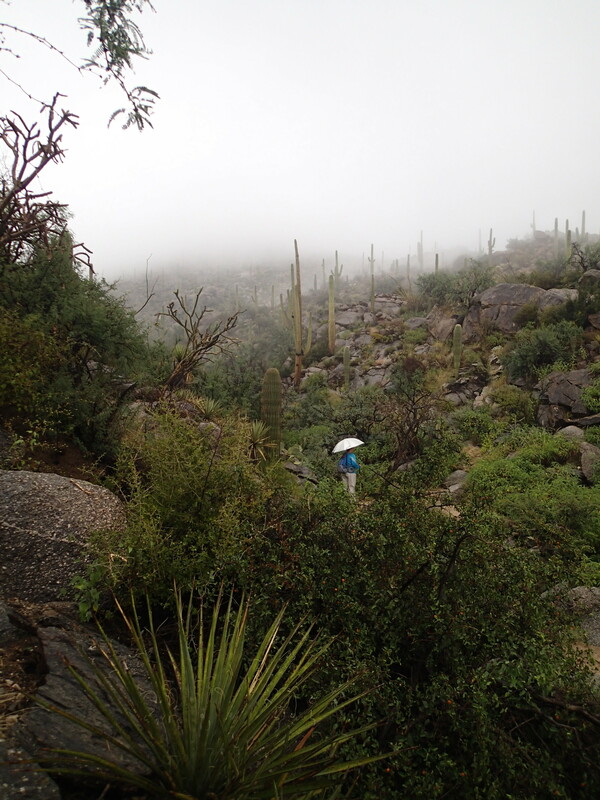 I love a good shuttle hike in the Catalinas, it’s one of my favorite ways to enjoy my home mountains. 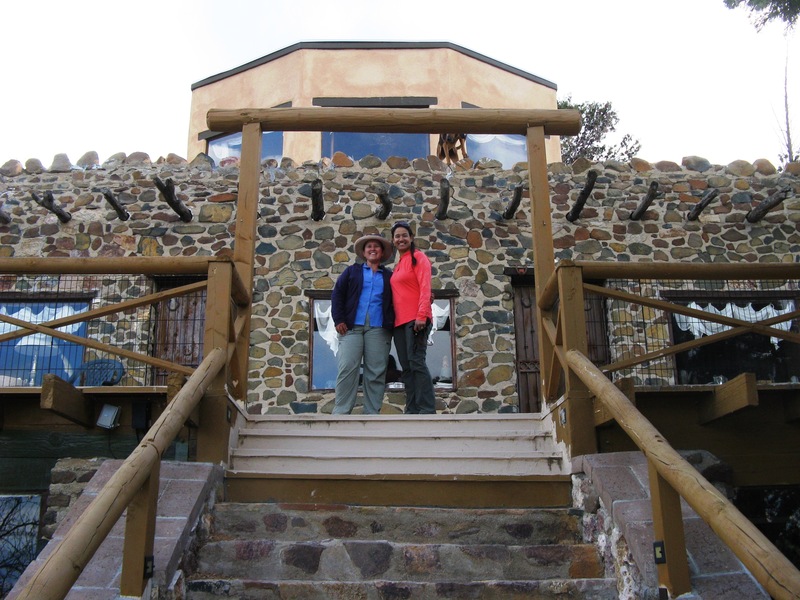 India and I had known each other in the late 90’s- early 2000’s when I worked as an archaeologist with SWCA Environmental Consulting and had reconnected through her signing up for a couple of the Arizona Trail Trek hikes. 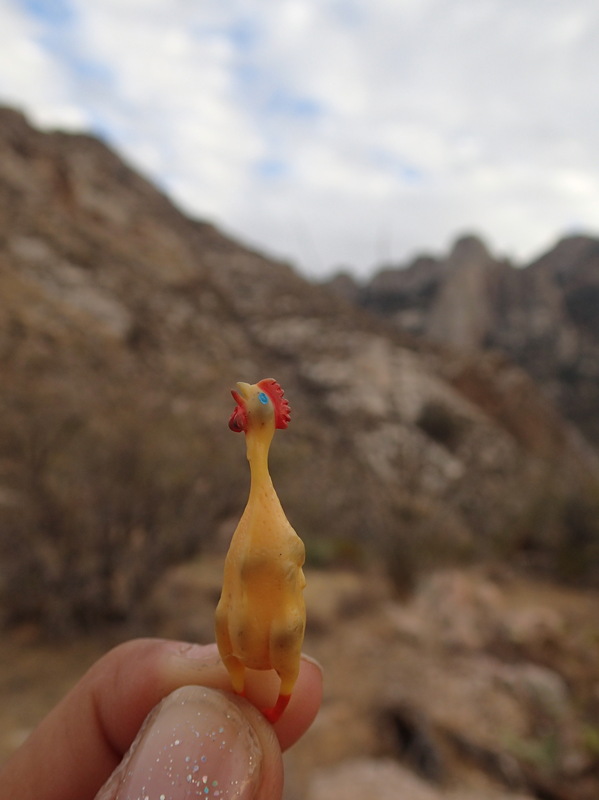 She was the only taker for this particular backpacking trip. 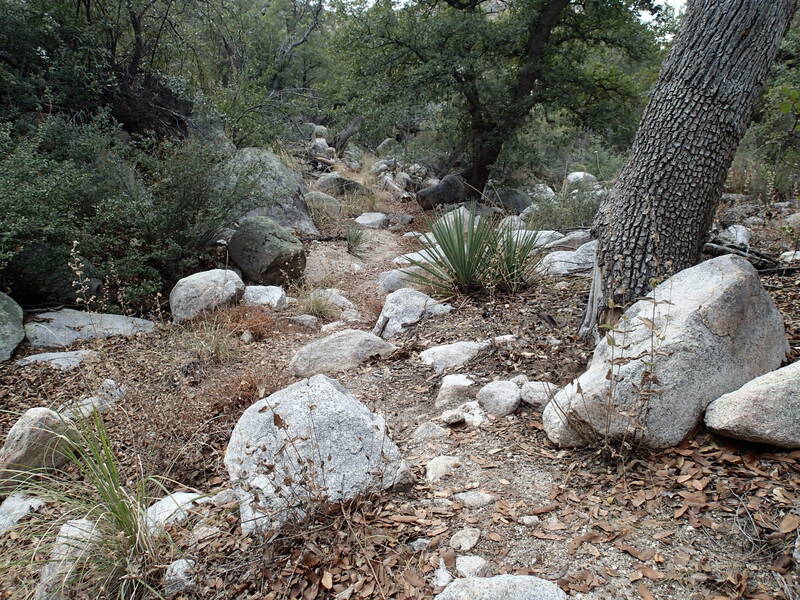 The Wilderness of Rock Trail is breathtaking- since hiking it for the first time in 2008 on my AZT section-hike, I have come back again and again. Such a magical place with hoodoos and impossible rock balancing acts. We filled up our water at Lemmon Creek and then began our descent toward Romero Pass. 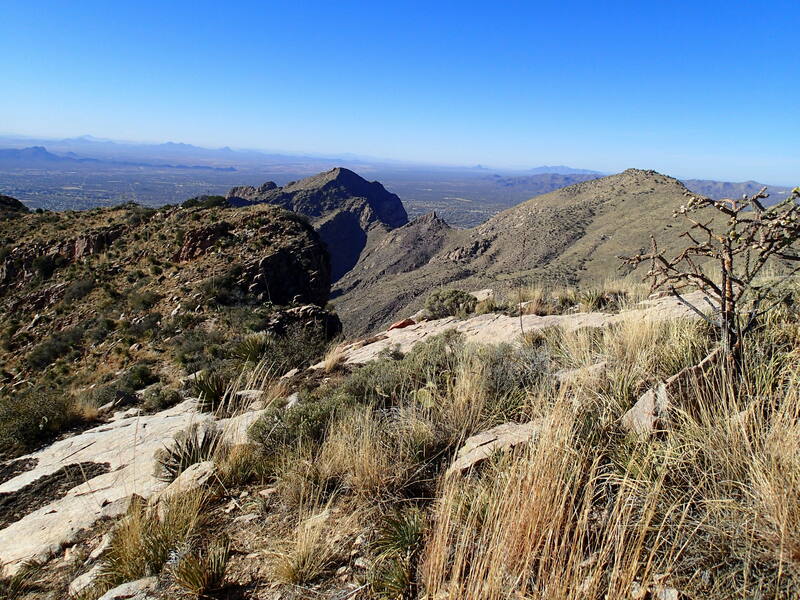 The trail gives incredible views of Cathedral Rock and Pusch Ridge, even little Sombrero Peak in the Tucson Mountains. Met Maverick again and wished him well on his way to Oracle. Romero Pass was windy as usual and we looked for bighorns but didn’t see any. 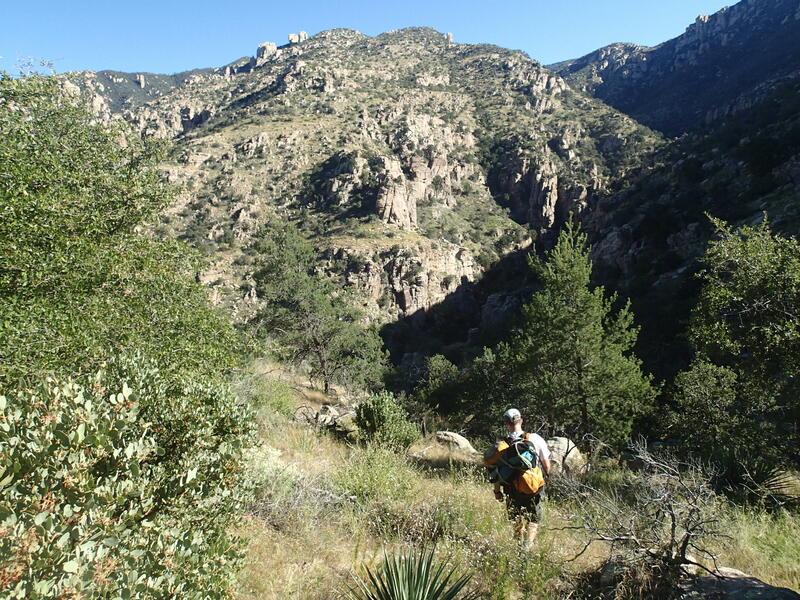 We switchbacked down the hill and finally reached the Cathedral Rock Trail junction and the canopy of the West Fork Sabino Canyon. 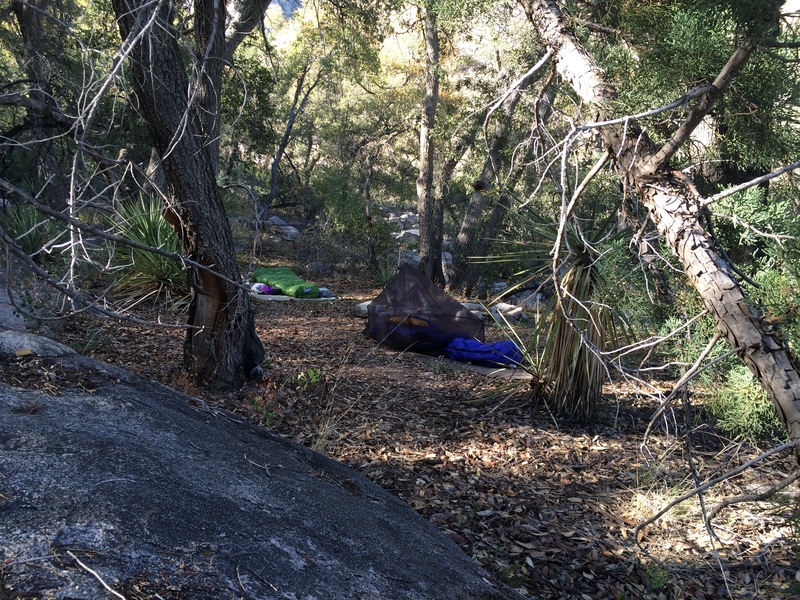 It was too early to camp, so we meandered along the trail a while longer, crossing the dry creekbed. 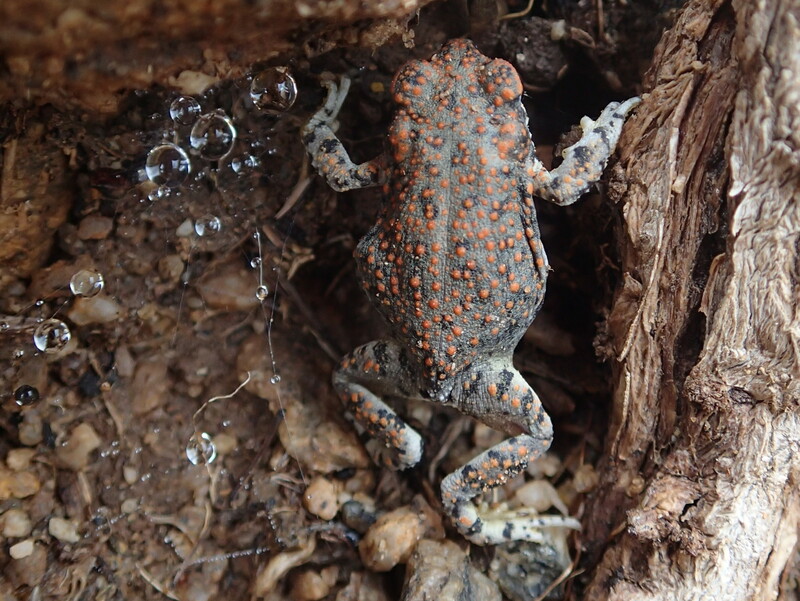 India spotted a fire ring at a flat spot in the trees and we found a home for the night. 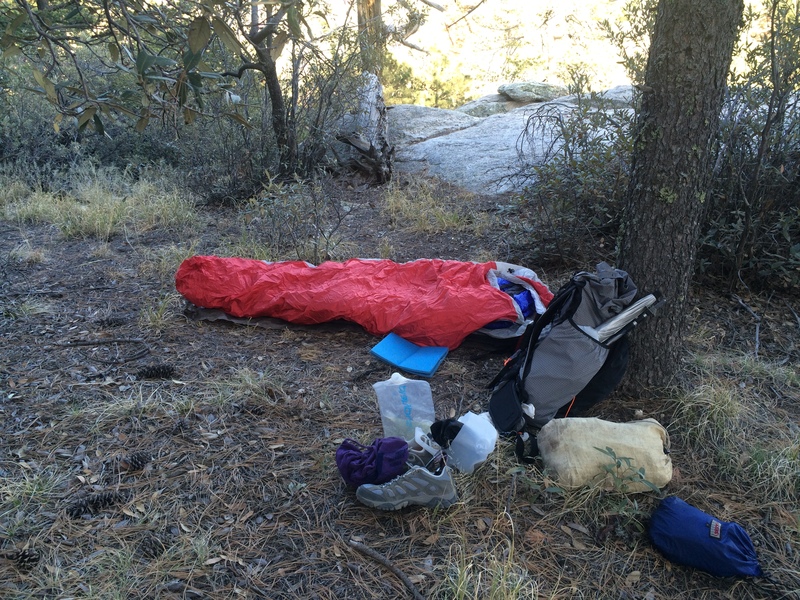 The West Fork is home to massive junipers and oaks and we really enjoyed our camp and hike the next morning. The trail then dropped back into the desert and we reached Hutch’s Pool. 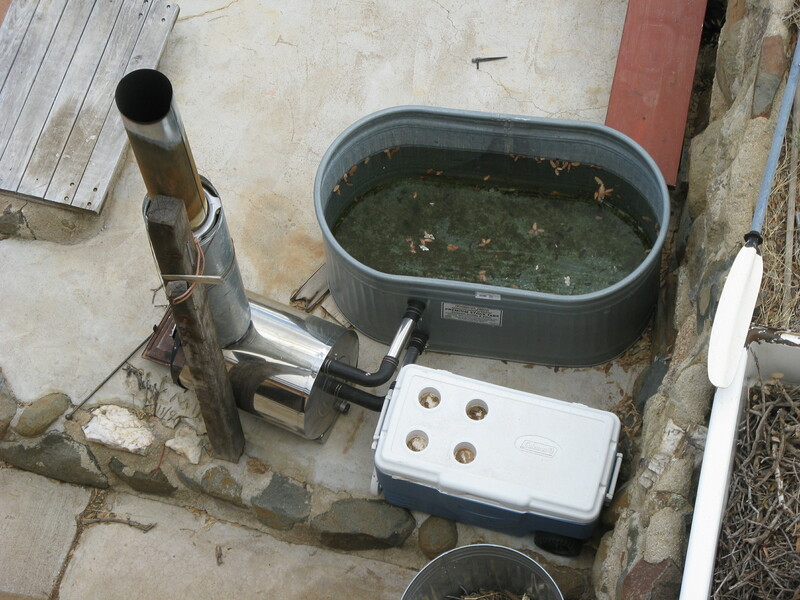 Too cold for a swim, I dunked my feet instead and fondly recalled times spent here with my pool floatie. 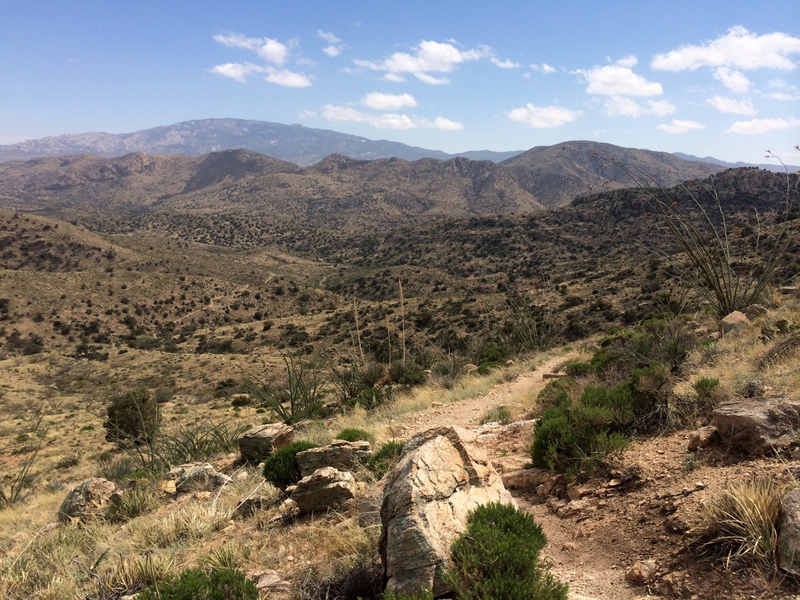 The hike out of Sabino Basin on the East Fork and Sycamore Trails went smoothly and soon we were at Shreve Saddle, one of the best views in all the Catalinas. A short downhill later, and we were back at Prison Camp TH. Nice to be done early and have the afternoon off. 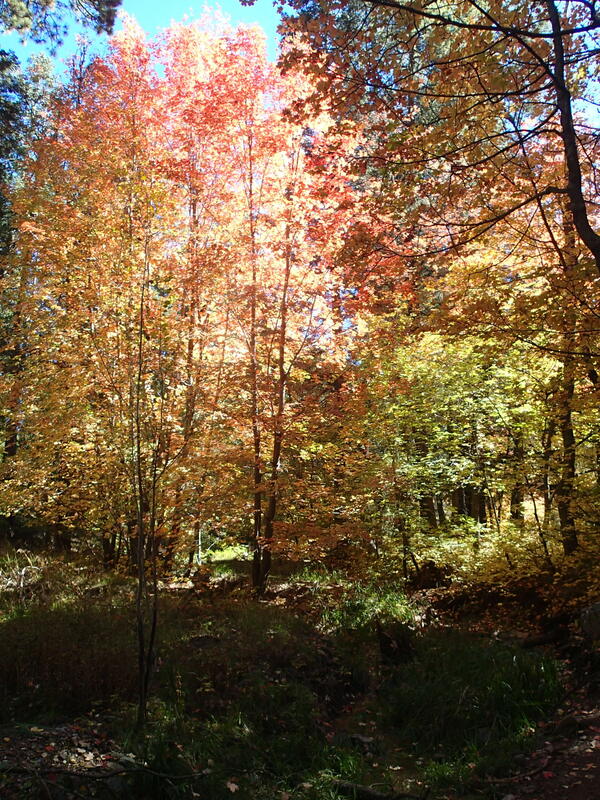 My husband, Brian met me and we stayed at Leigh Anne Thrasher’s cabin in Summerhaven. 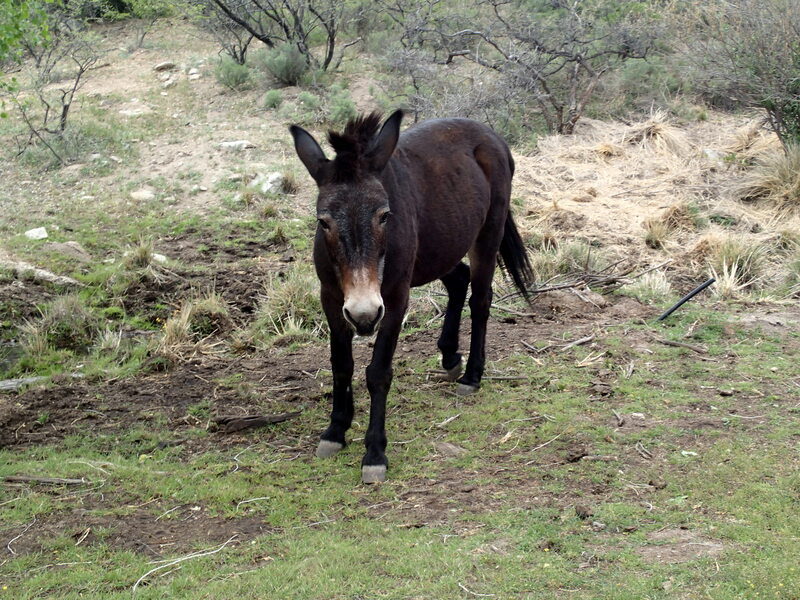 Leigh Anne is a great friend to the AZT and she and her mini-donkey Jasmine hiked up and over the Huachucas in Passage 1 with me. It was great to spend some time with my husband, visits are going to be fewer and farther between as I head farther from my home in Tucson. 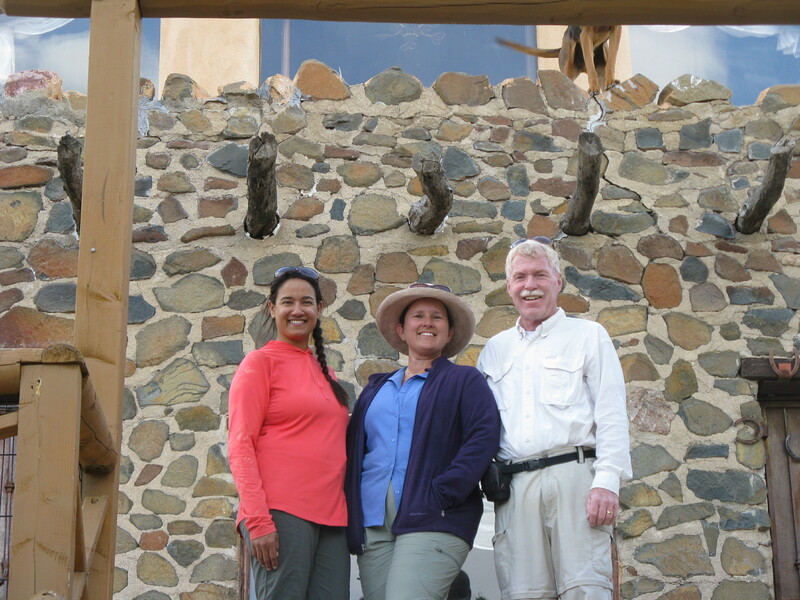 The next day my friends Wendy and Bill met me in Summerhaven for the hike down Oracle Ridge, but that’s a story I’ll leave for Bill to tell you in an upcoming guest blog. 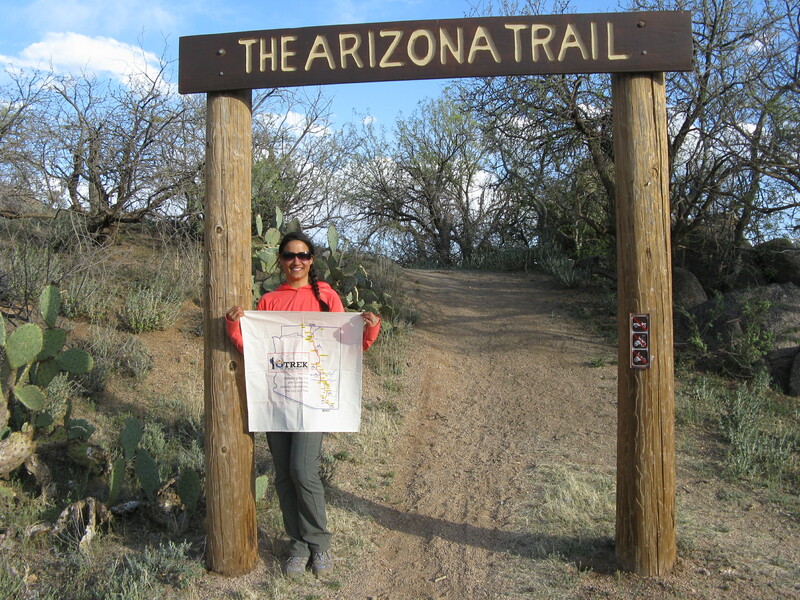 When I reached the American Flag Trailhead, it marked 200 miles so far on the Arizona Trail Trek- what a great feeling! 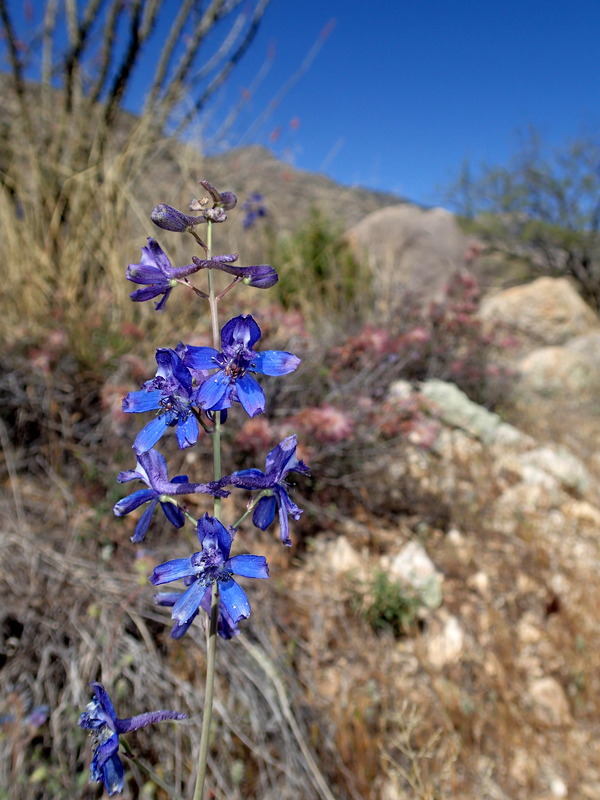 I have been incredibly busy planning my upcoming Arizona Trail Trek– a thru-hike to promote the trail, our new guidebook, and the Gateway Communities. 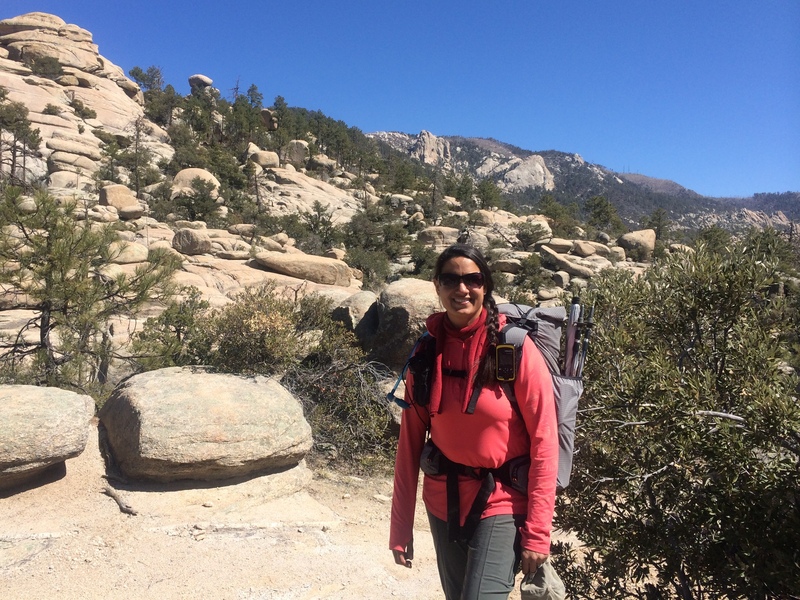 I’m starting on March 14th and it’s been a challenge to plan all the things that go along with a thru-hike plus all the fundraising events in the communities along the way. 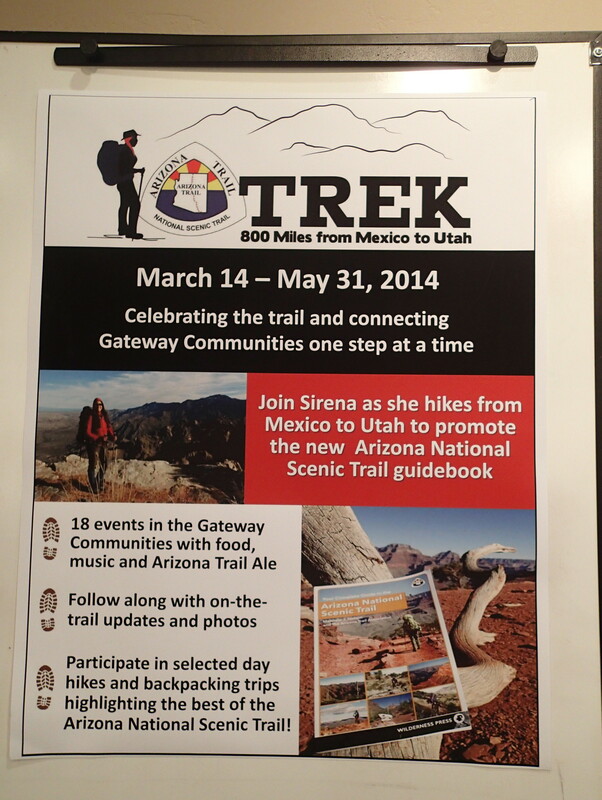 Here’s a promotional poster for the hike, I’ll have the website is www.aztrail.org/azttrek. Getting excited to actually get out on the trail! Today was one of those days where I just had to turn off my phone and go for a hike. Haven’t been up this trail in a while and figured the hike to the pass would provide a good workout. 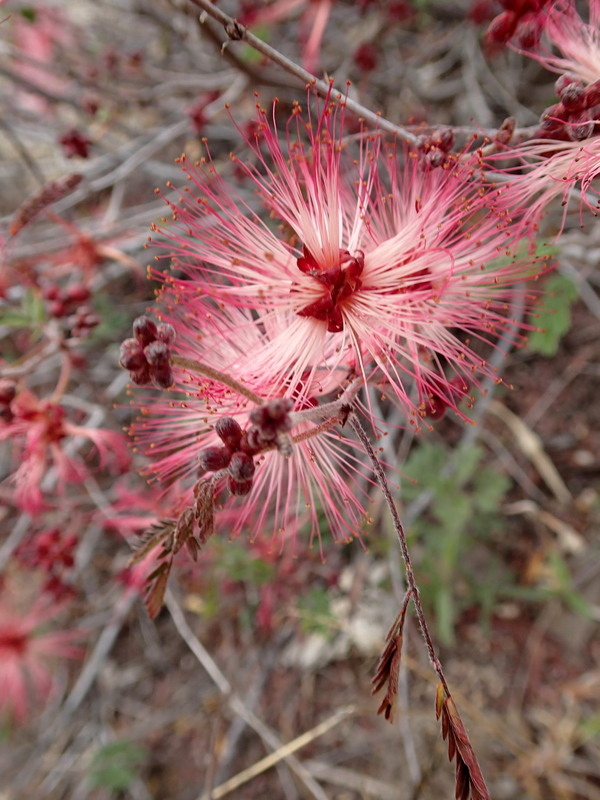 Started around 9:30 and made my way to the pools, lots of blooming fairy duster lining the trail. Only encountered a handful of folks beyond the pools. 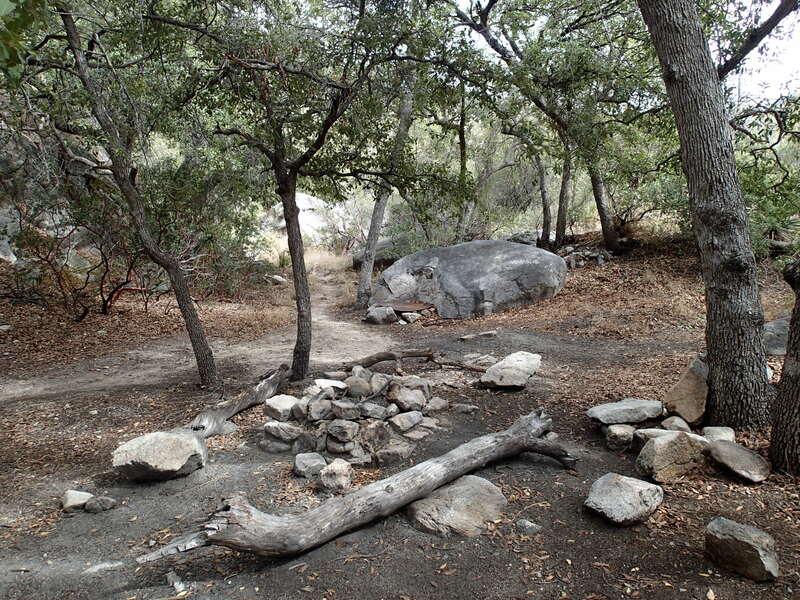 I forgot how beautiful the trail is above Old Trail Camp, winding through the oaks and junipers and big boulders. I took a break at the waterfall campsite, which has a wonderful log seat with a backrest. The weather was perfect for the last climb to the pass. The pass was windy, as usual. 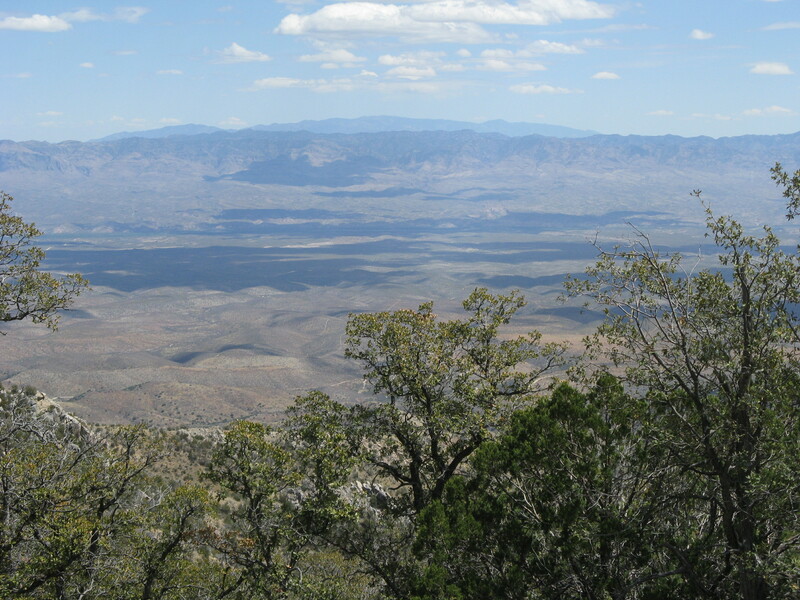 Great views down the West Fork toward the snowy Rincons. I said hi to the Arizona Trail and cut my break short because I was getting chilly. 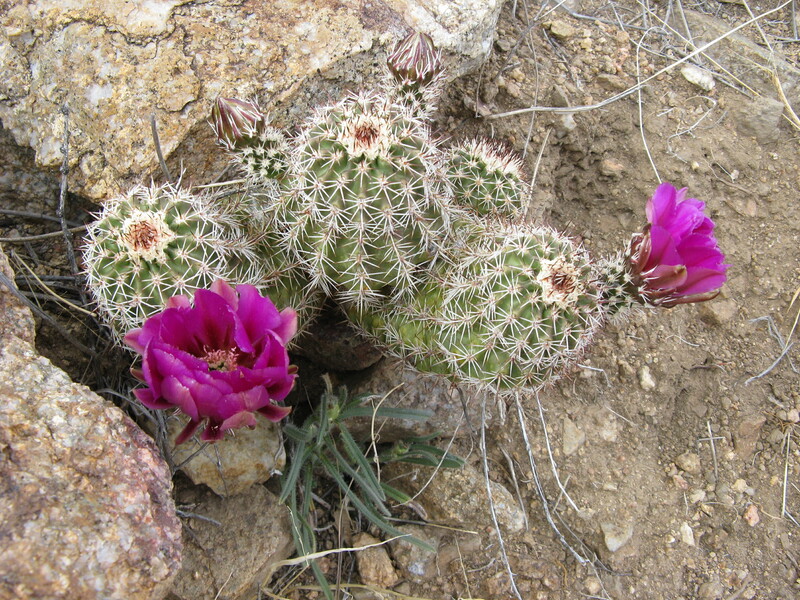 Arizona Trail- always a welcome sight! As I left the pass, I noticed that Romero Canyon looked like it was getting rain, but up at 6000 ft I got snow flurries! 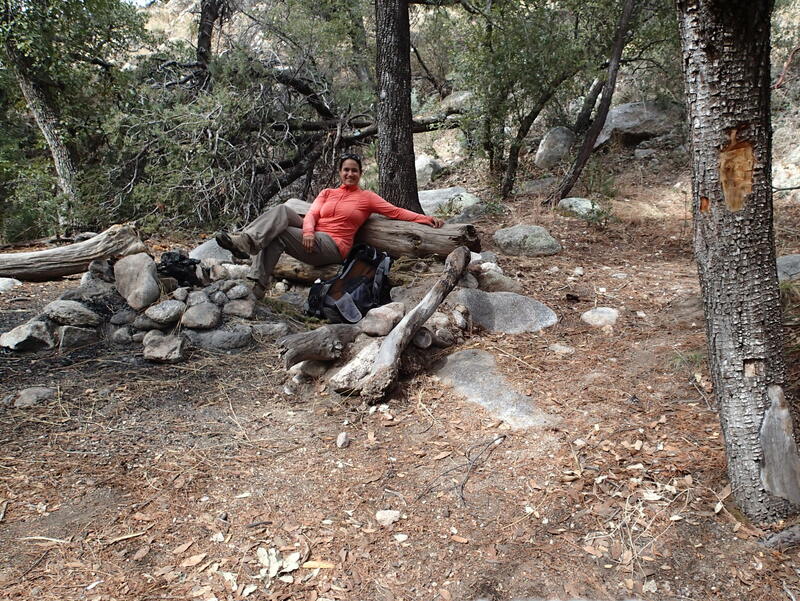 They were short-lived and I made my way back down to the waterfall campsite to lounge for a bit on the log seat. 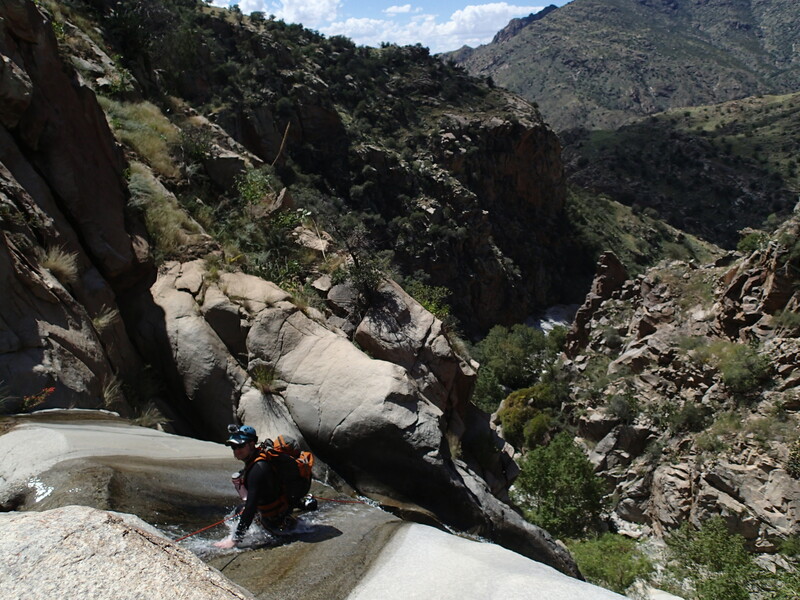 This trail is so beautiful, I would really like to do the canyoneering route in Romero Canyon one of these days. 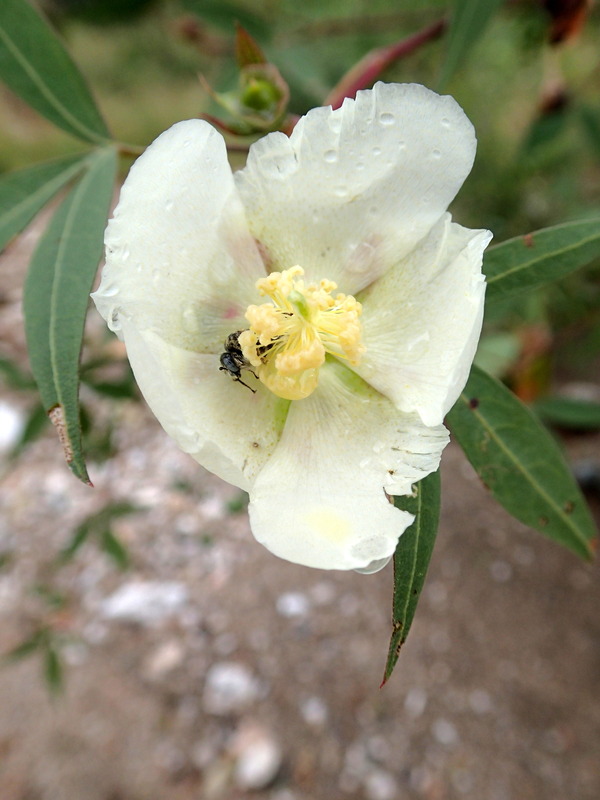 I stopped to take pictures of all the different wildflowers I saw- nice variety, hopefully we get more rain soon. I reached my car and decided to wait and watch the sunset before leaving. 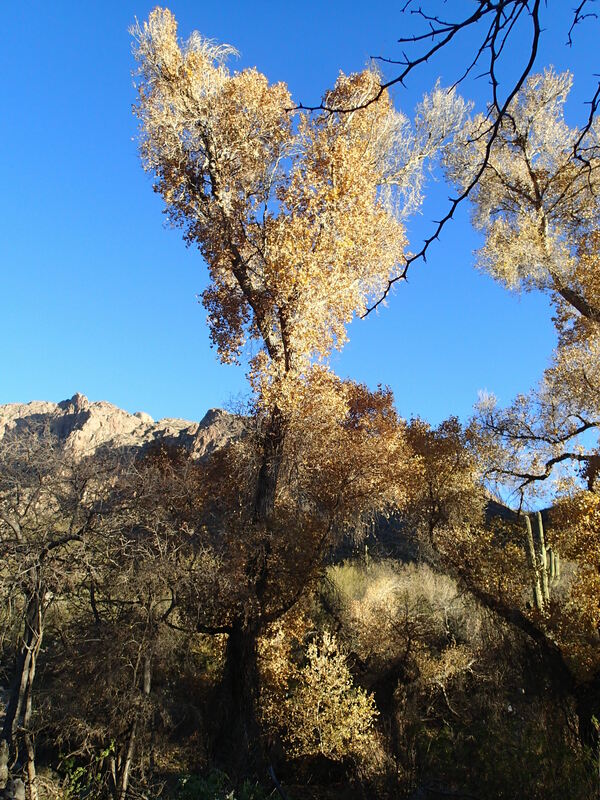 So glad I did, it was a symphony of light and color on the Catalinas as well as to the west. 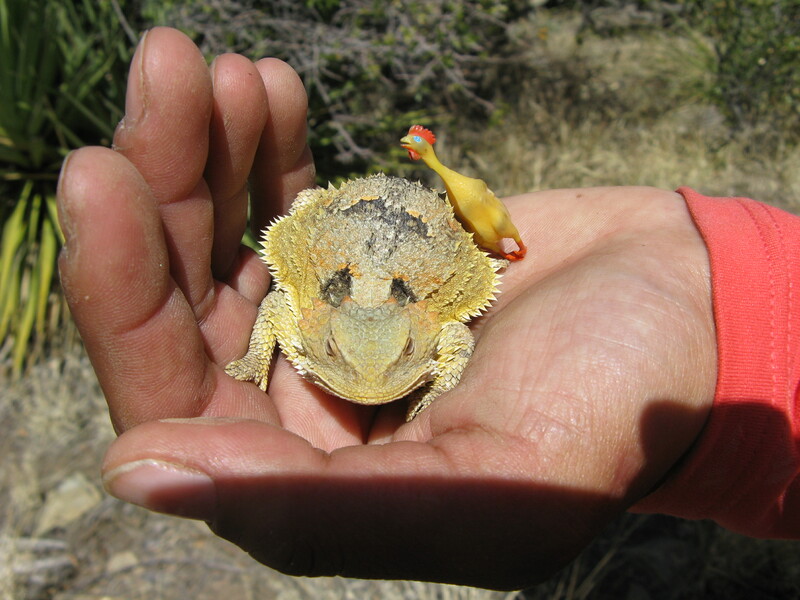 In Wildlife Rehabilitation news, I have not been able to volunteer much lately at Wildlife Rehabilitation Northwest Tucson because I am so busy planning my thru-hike. I miss the birds!! 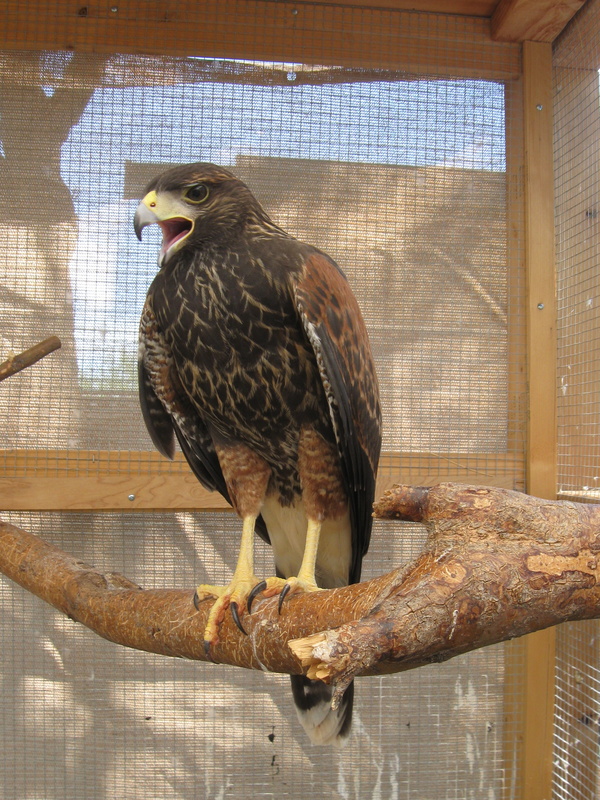 Here’s a picture of a hungry hawk- your donations keep these guys fed and housed! 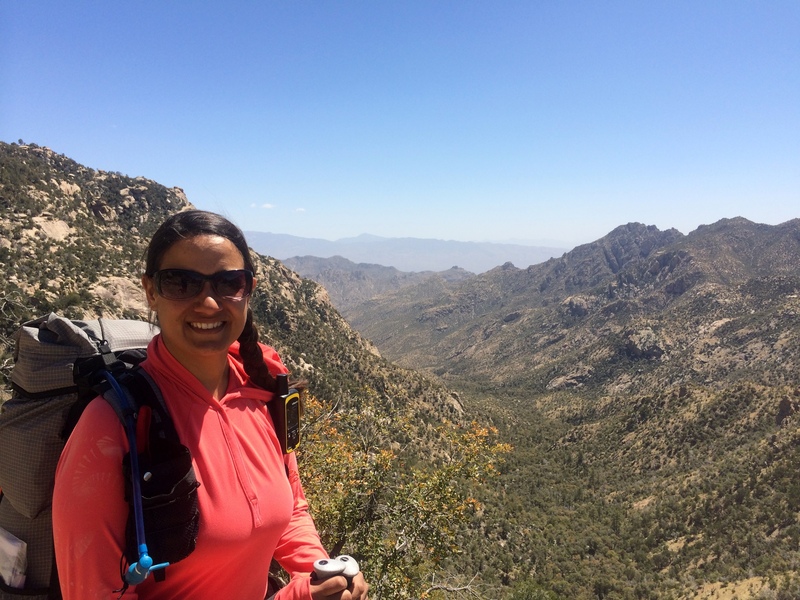 I am going to be taking a short break from fundraising for the Wildlife Rehab and switching my focus to fundraising for the Arizona Trail Association during my Arizona Trail Trek. 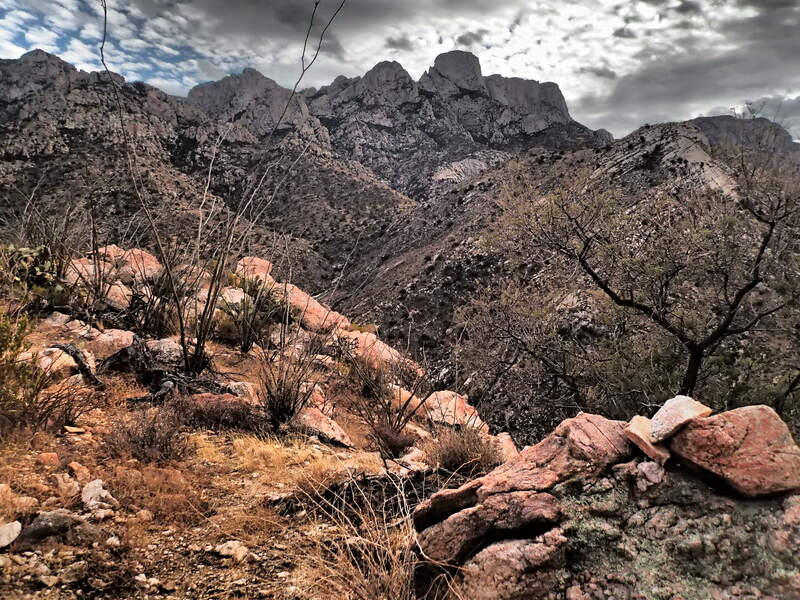 I’ve got an Indiegogo crowdfunding campaign with unique and exciting incentives coming up to raise $20,000 for the Arizona Trail Association starting on March 28th. 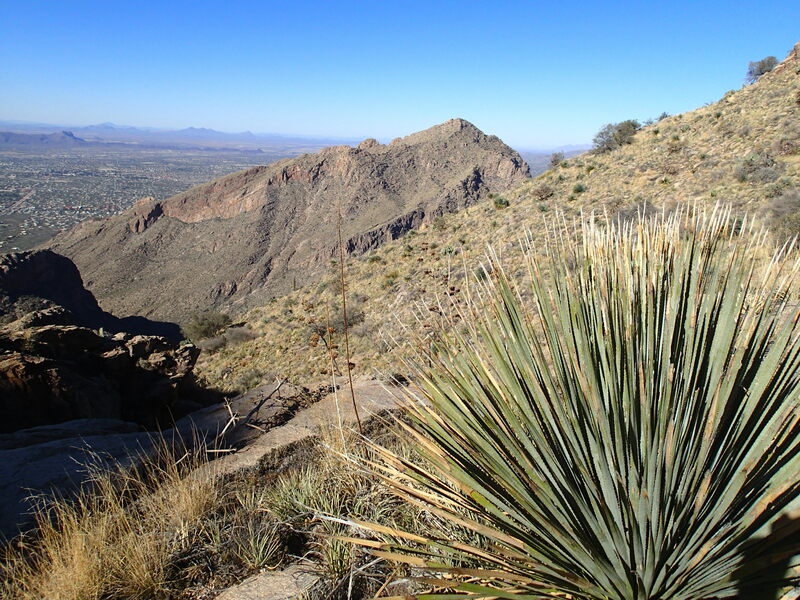 From January 1st- April 30th, the Bighorn Sheep Management Area of the Pusch Ridge Wilderness is off-limits to off-trail travel. I can’t say enough about how much I enjoy off-trail travel. 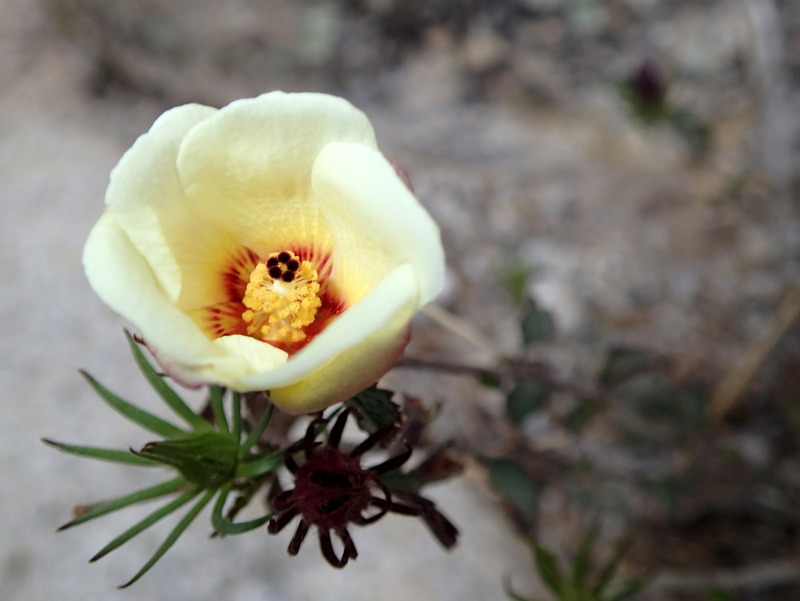 It opens up a world of possibilities and I like the challenge of route-finding. 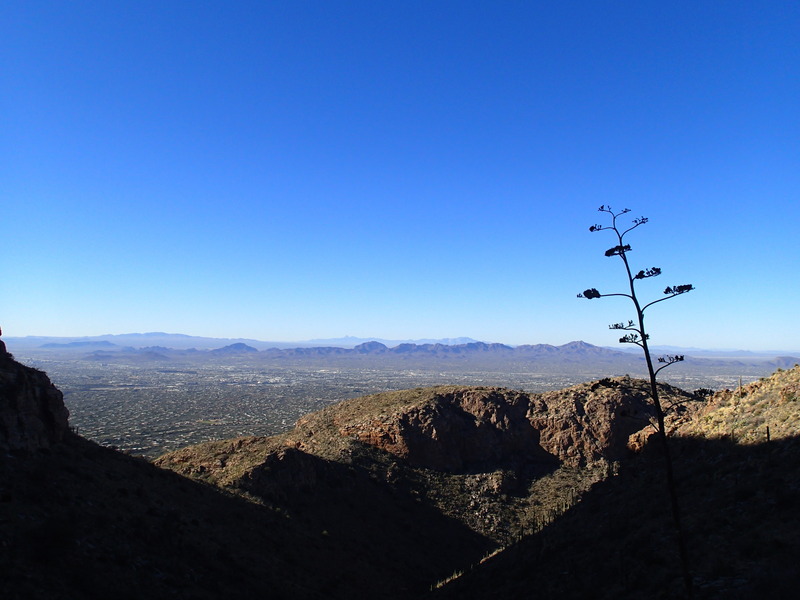 I wanted to make the last day of the year count and chose Prominent Point as my hike for December 31st . 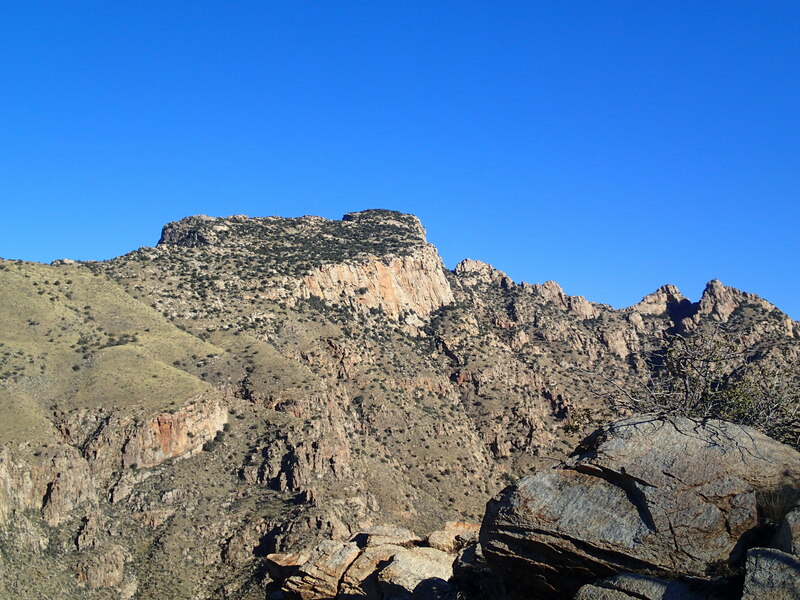 I had been doing some research on different ways to summit, but chose the Pima Canyon approach for my first attempt. Bill and I started hiking around 7:30 am. The HikeArizona.com description says that the turnoff into the canyon is about 1.6 miles in, it is actually more like 2 miles. The entry is across the creek from the big slabs that I took to Table Mountain last year. There is a nice cairned route that pretty much stays in the canyon bottom. Rosewood Point looms above, but not for long. We stopped to take a break and noticed that we were at the junction where you go to the right for Rosewood Point. We followed another cairn for the route that curved to the left. The canyon bottom here was pretty open and we had several sections of big slabs to walk up. It got steeper, but didn’t require any scrambling. 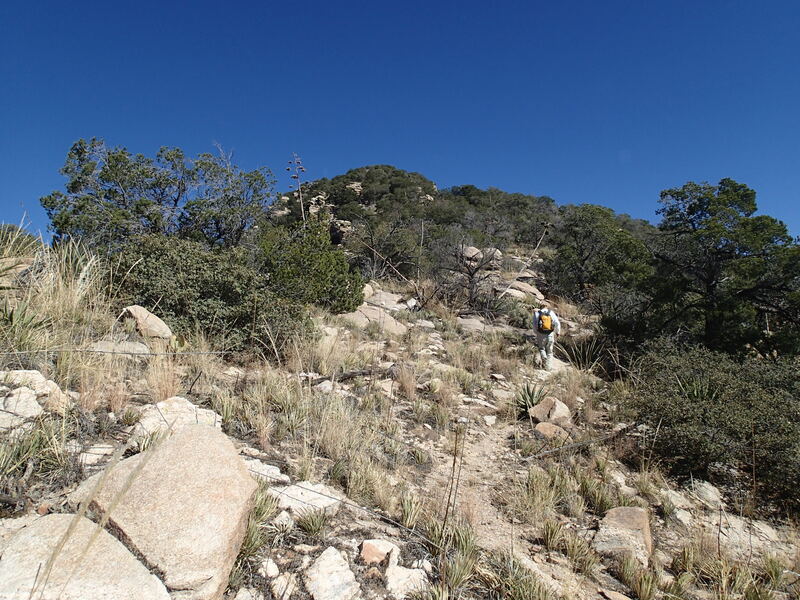 We had to ascend toward a saddle with a cliff on the left. No longer on a route, we shot straight up the hill. 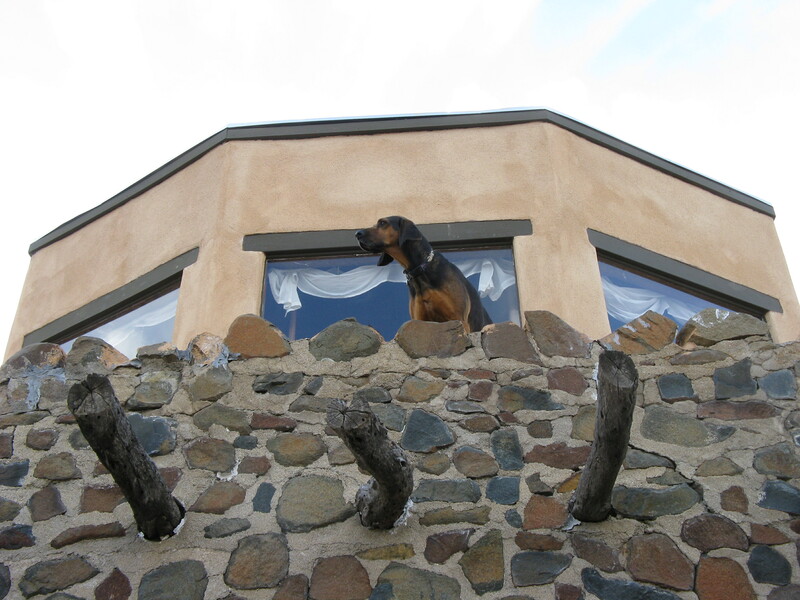 Big rocks came loose from the soil below and shindagger threatened every step. This was the worst footing of the day, both up and down. 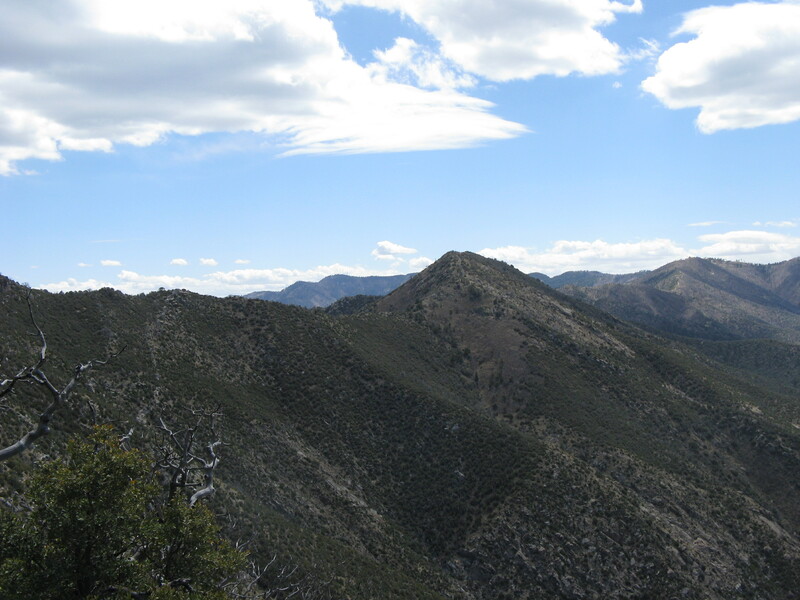 We reached the saddle and saw our next big climb past the Thumb to the ridgeline. 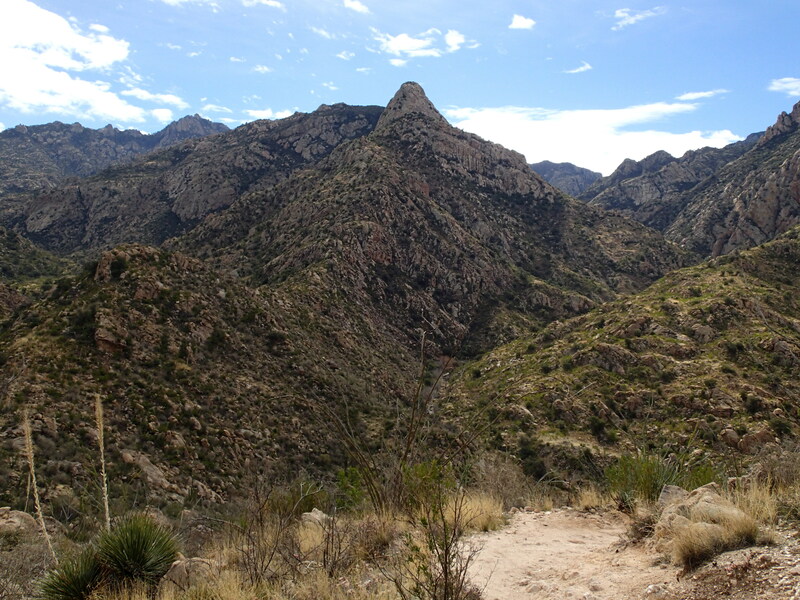 There were great views into Pima Canyon of the Pusch Ridge peaks. 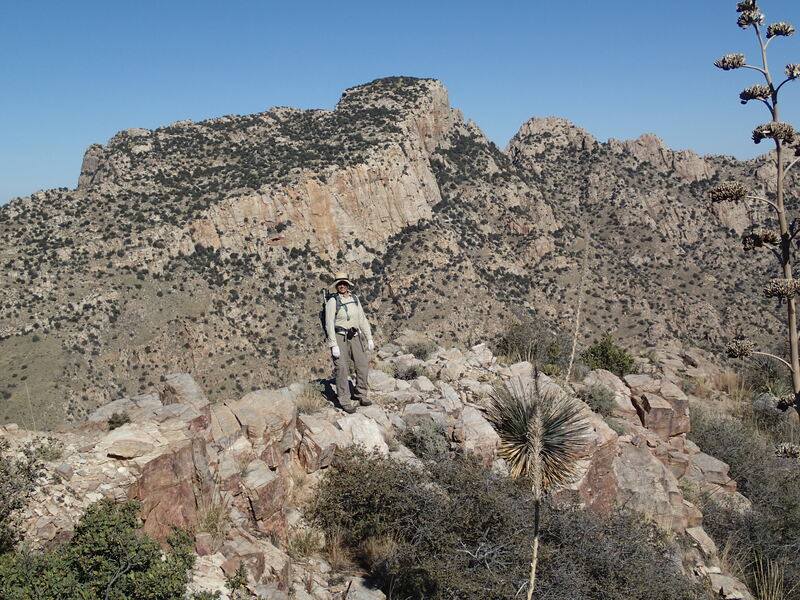 Sadly, for all our climbing, we were not yet above Pusch Peak. Up until now, we’d been in the shade of the canyon. It was surprisingly hot for the last day of the year. There was a pretty good route heading toward the Thumb- what an impressive slab of rock! Finally we reached the ridgeline and the views were incredible. It was pretty easy walking for most of the ridgeline, just a few small scrambles where it narrowed down near the drainages. The summit loomed ahead, the final slope steep and unrelenting especially after a long day of uphill. 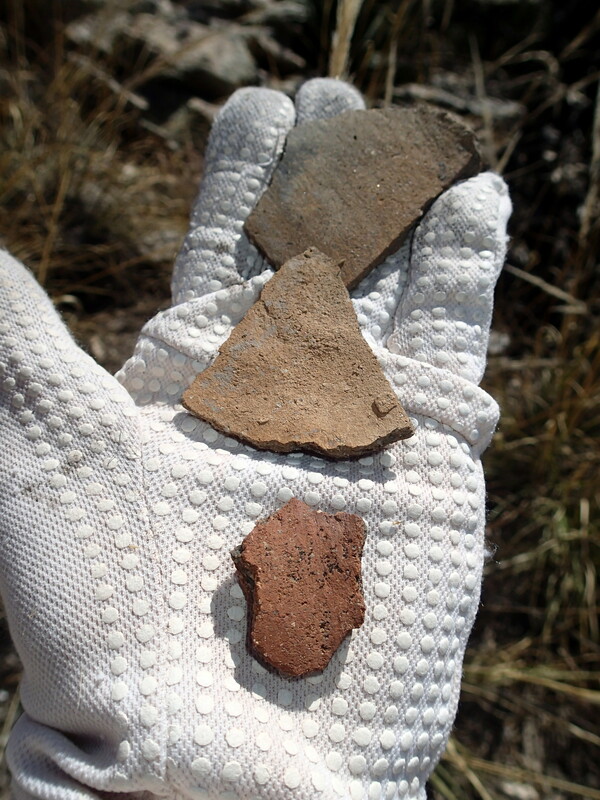 Patches of snow appeared and below the summit I found several large pottery sherds. I would imagine this peak would make a good lookout, given its prominence. 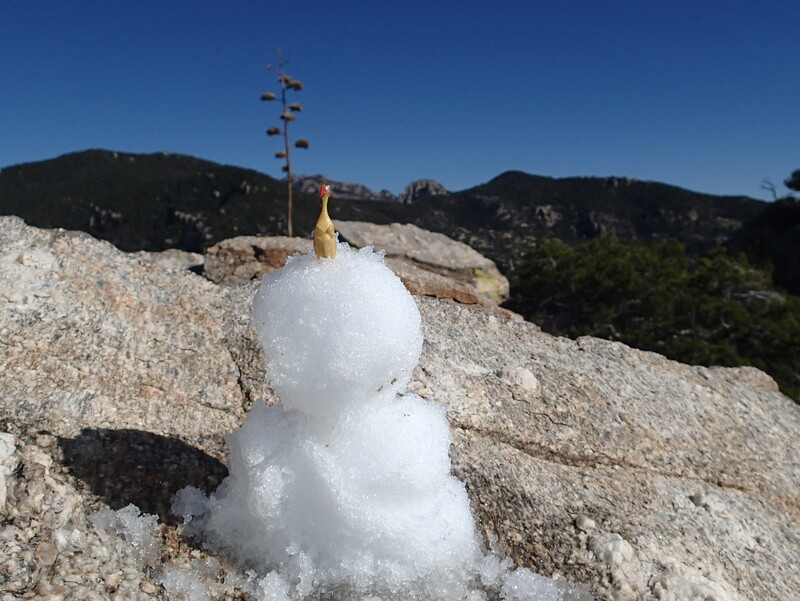 We reached the small maze of rocks that make up the Western summit and made a snowman. 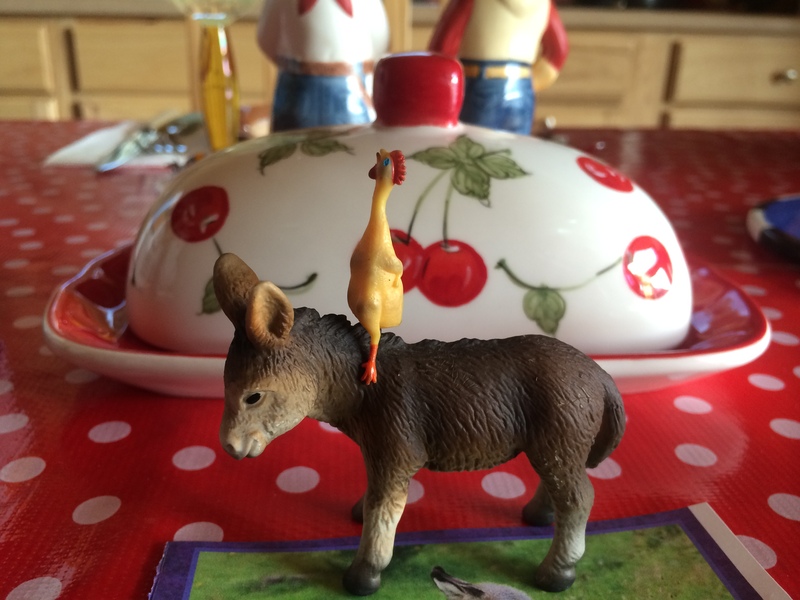 We posed on top with our New Year’s accoutrements. The summit has fantastic views in every direction, too many peaks to name visible. A peregrine falcon flew overhead- what a great way to spend the last day of the year! The lighting was spectacular on our way down. 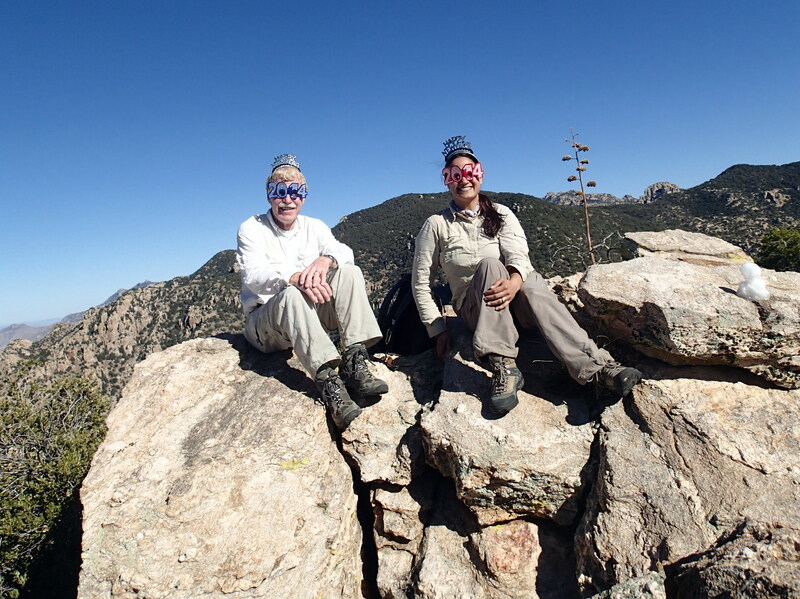 We managed to be on a route for most of the time which sped progress over straight bushwhacking. 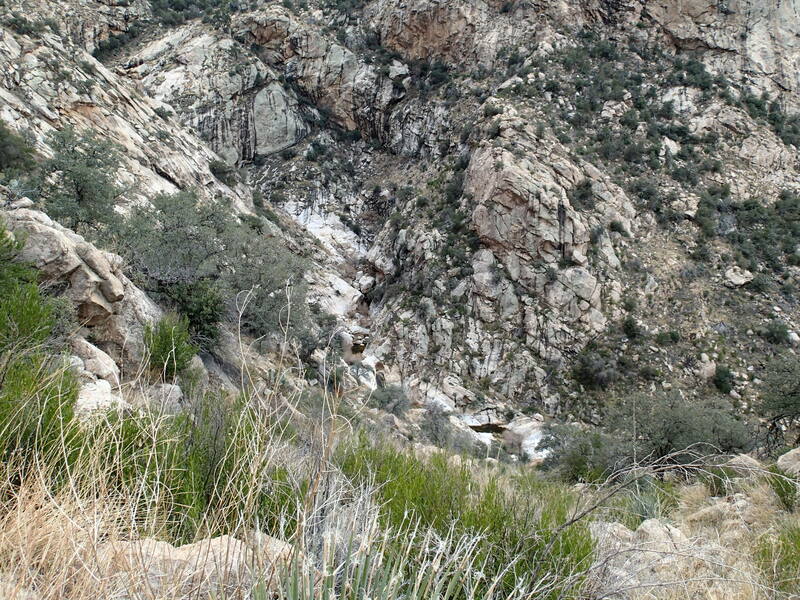 Still, the slope from the cliffs to the bottom of the canyon bend was really loose and unpleasant. It eased up considerably once we got back down to the streambed. 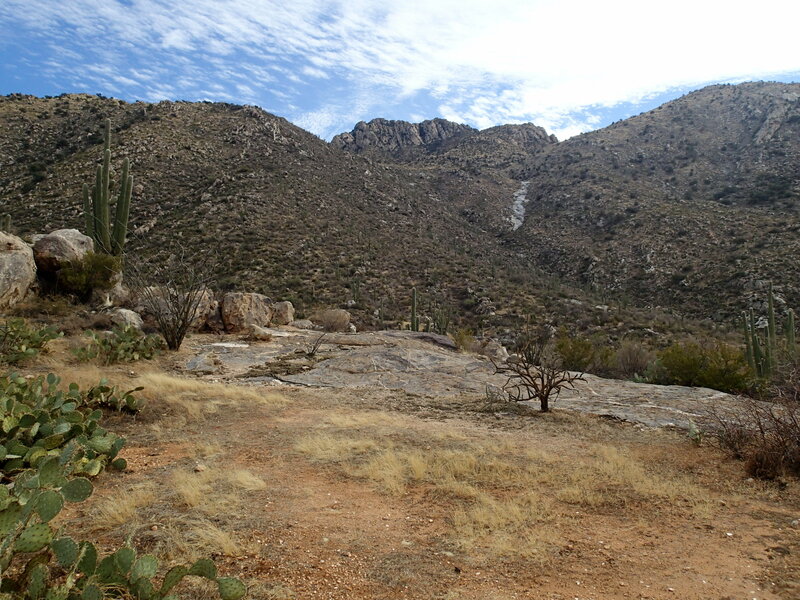 We took a break once we hit the shade, right before the side canyon curved back toward Pima Canyon. It is amazing how quiet and remote it feels back there, even though all that is between you and Tucson is Rosewood Point. 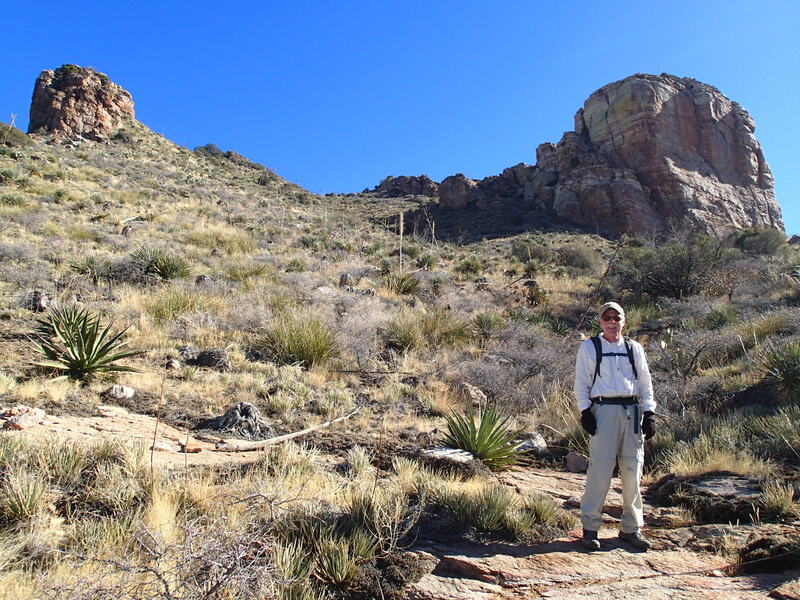 The Pima Canyon Trail seemed like it dragged on forever as usual, we saw our first people of the day a mile away from the trailhead. Made it back in time to watch the sunset light on Prominent Point. 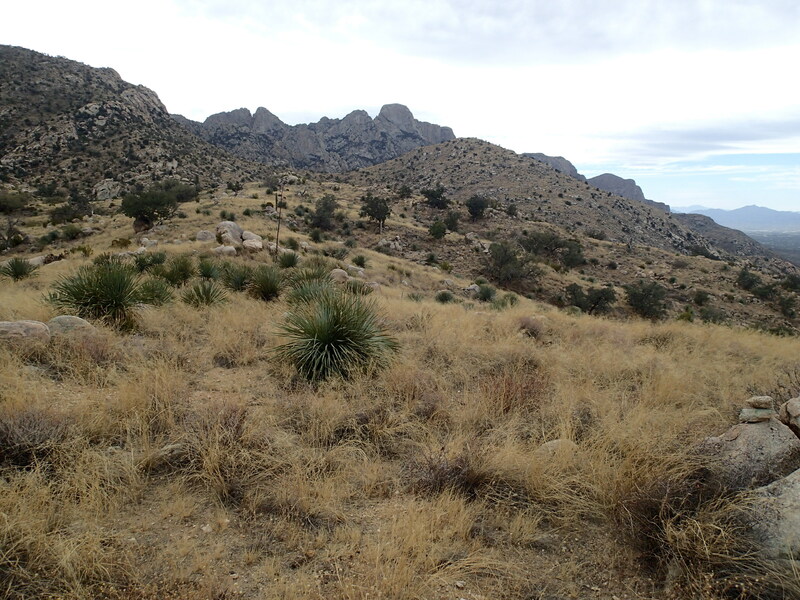 It doesn’t look as far away from the trailhead, because the long ridge is foreshortened. Although it was a great hike, Bill and I agreed that it would have been even better with Wendy along. She’s been nursing a bum Achilles tendon- hope she heals up soon so she can join me on bushwhacking adventures again in the new year. Overall, the terrain and the route was easier than I had expected. It’s a long day, but the views are totally worth the collection of scratches you’ll amass hiking to Prominent Point. 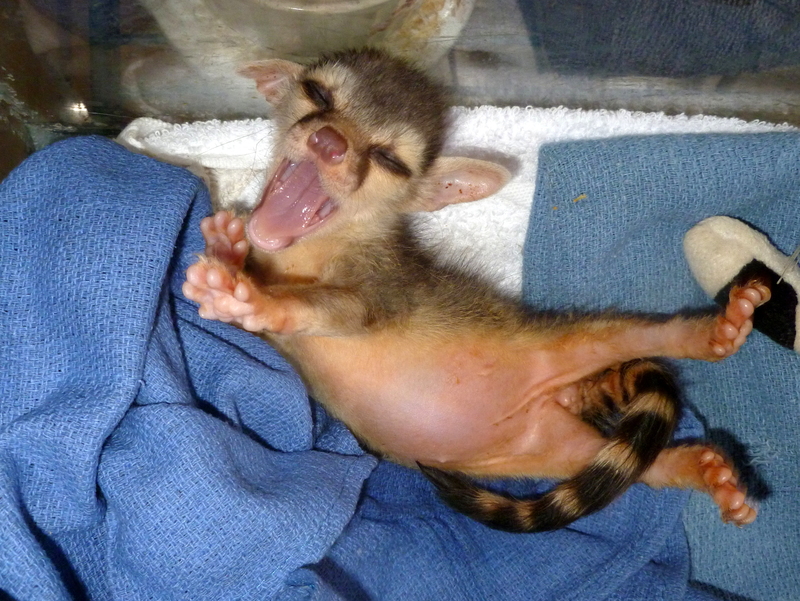 In Wildlife Rehabilitation news, I’m trying to get in as many shifts as I can before I leave for my thru-hike of the Arizona Trail on March 14th. 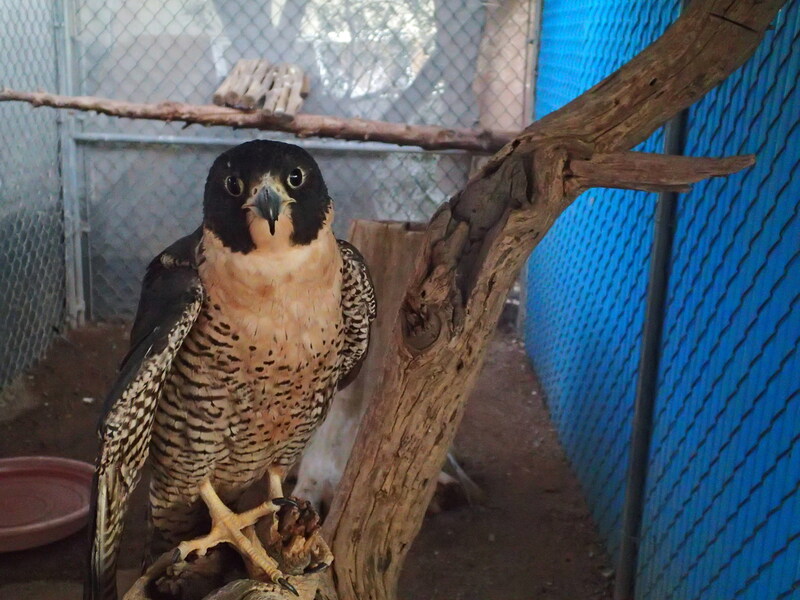 We’ve got quite a few interesting characters at Wildlife Rehabilitation Northwest Tucson, including three Peregrine Falcons. This one we’ve had for a while will eat from the fist. So I get to go into the cage with a plate of food, offer up my arm, and it hops on and I let the Peregrine eat from the plate in my hand. What a magical experience to be able to work so closely with the world’s fastest bird. 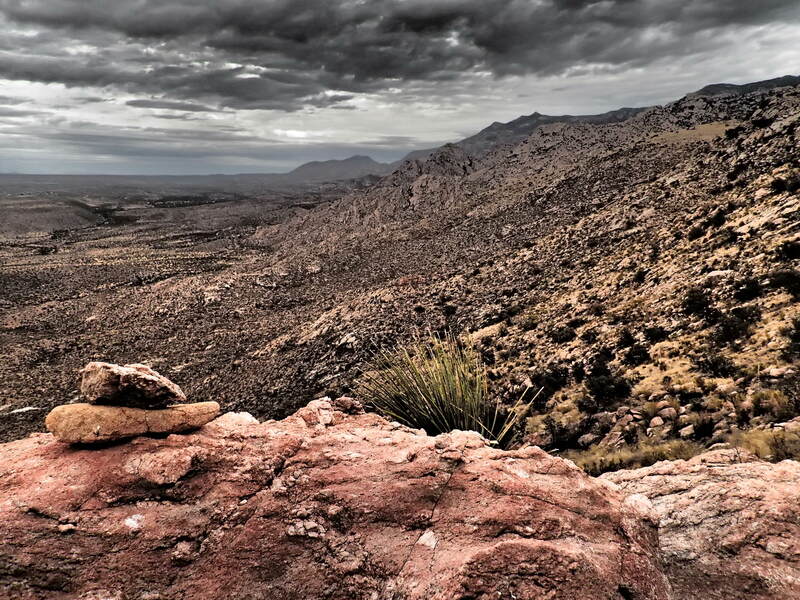 In 2010, I was looking at pictures on HikeArizona.com when I came across a photo of Palisades Canyon that took my breath away. I have looked at it many times over the years, it’s one of my favorites. 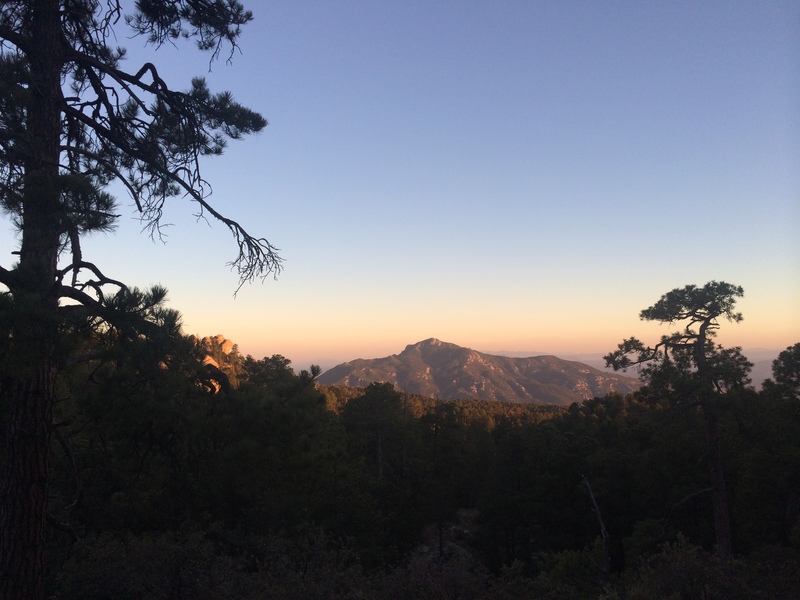 Such an incredible place, and right in my own backyard in the Catalinas. 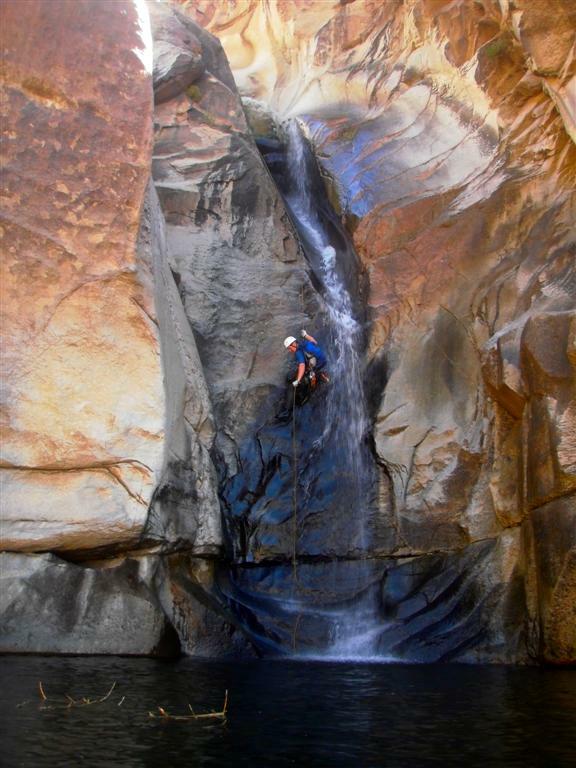 The colors and textures of the canyon walls, the person rappelling in a beautiful waterfall into a large, black pool. 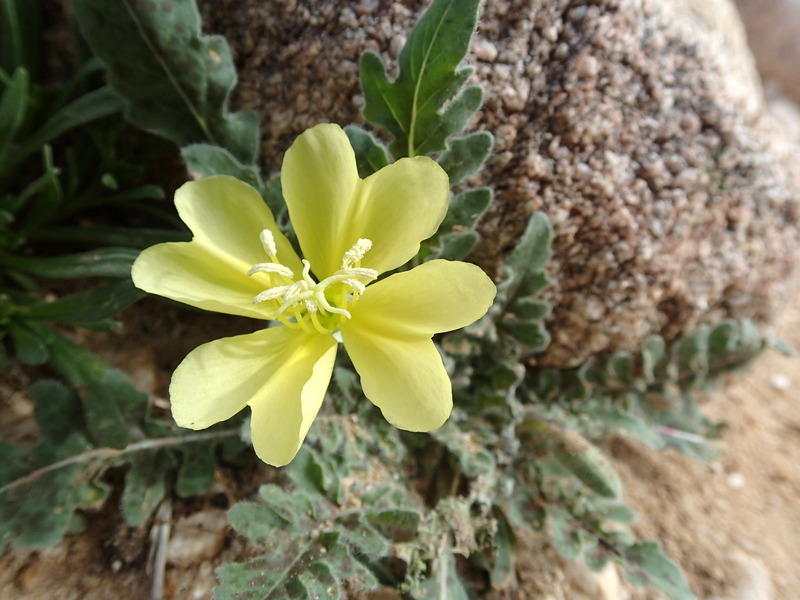 It was before I had ever gone canyoneering and when I checked the route description I saw that it was a strenuous route that takes 10-14 hours to complete. 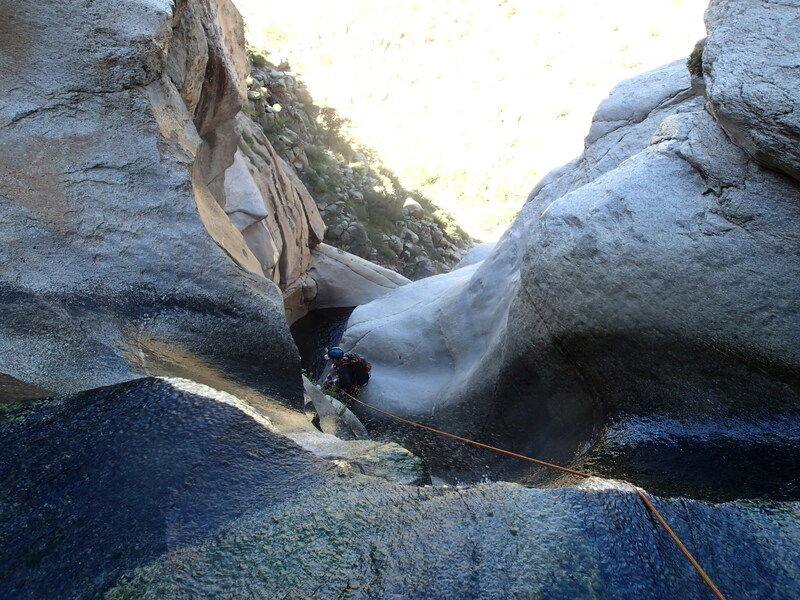 The picture is of the second in a series of seven rappels, many 100 feet or more. 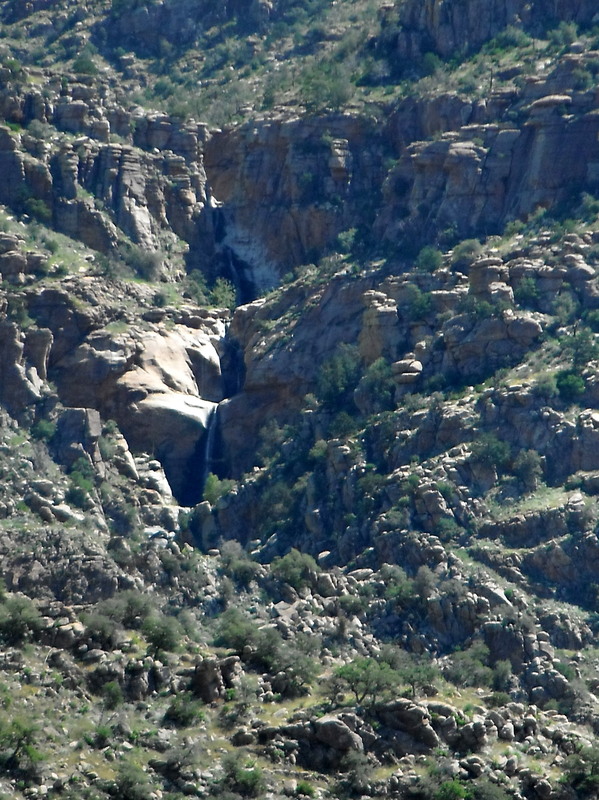 I have looked longingly at the falls in the canyon visible from the nearby Box Camp Trail. 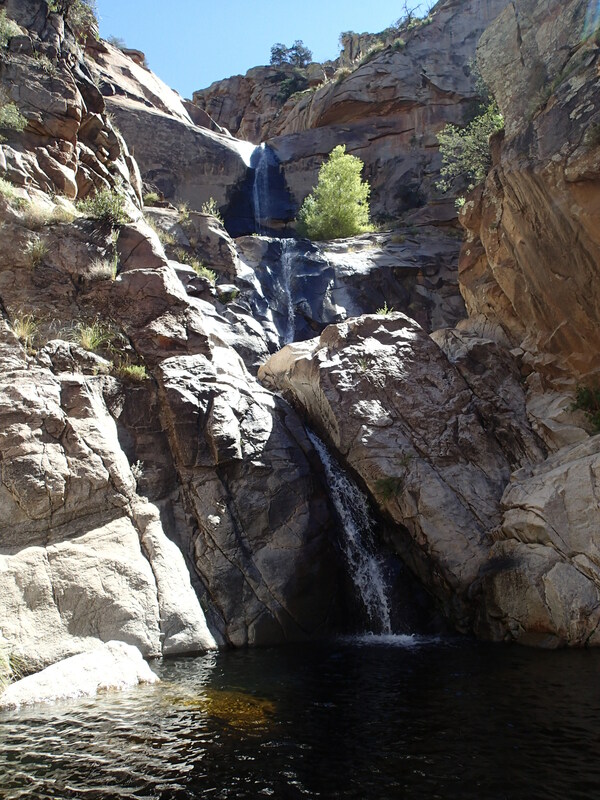 Since my first canyoneering trip I have been totally taken by the pools, waterfalls, strenuous routes, and exciting rappels that come with it. Early in September I saw trip reports and pictures of Palisades and contacted a friend to see if he was planning on doing it anytime soon. He said he wasn’t going to be able to go, but a friend of his who had been through several times before would probably be interested in doing it again. I got in touch with Russ and we planned a trip for September 21st. I hadn’t gone canyoneering in a little while, so before the trip I had a practice session hanging from my tree in the backyard. I was more nervous than I’d been in a while. A couple of groups that I knew had gone through the previous weekend and had epic 19 and 15 hour adventures. Russ Newberg and I were met at the Sabino Canyon parking lot by my dear friend Tom who graciously shuttled us up the mountain to the Palisades Trailhead. 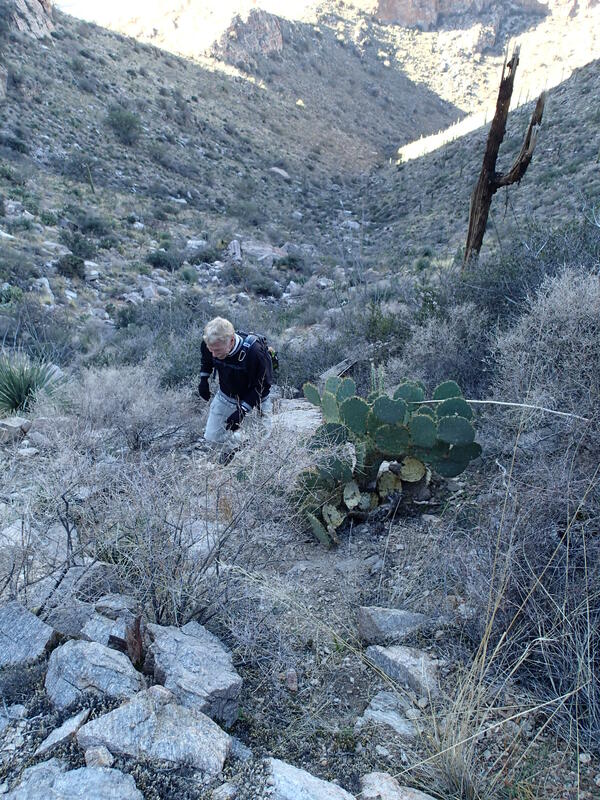 Tom is the leader of Tom’s Sawyers, a volunteer group that goes into the wilderness in the Catalinas and Chiricahuas and removes downed trees on the trails with 2-man crosscut saws. He even has a website where you can report downed trees for the Sawyers to work on. 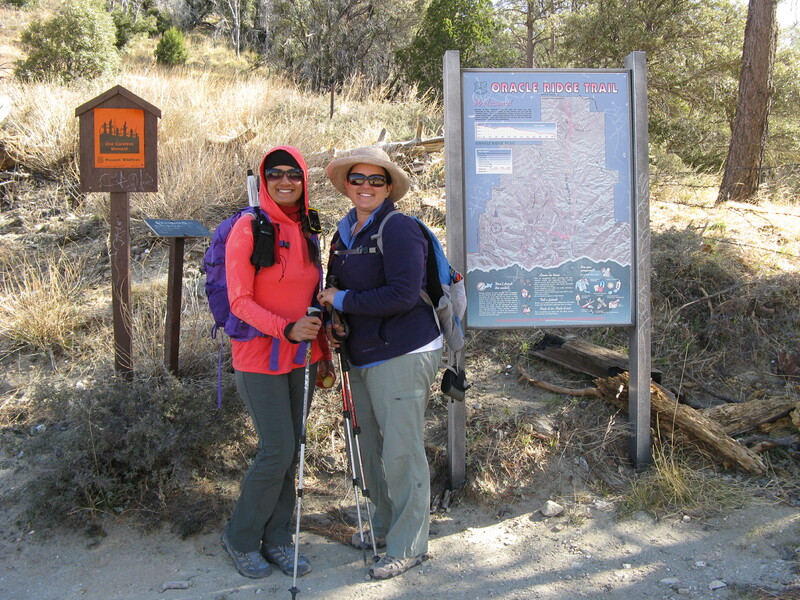 We reached the Palisades trailhead and were hiking by 7 am. 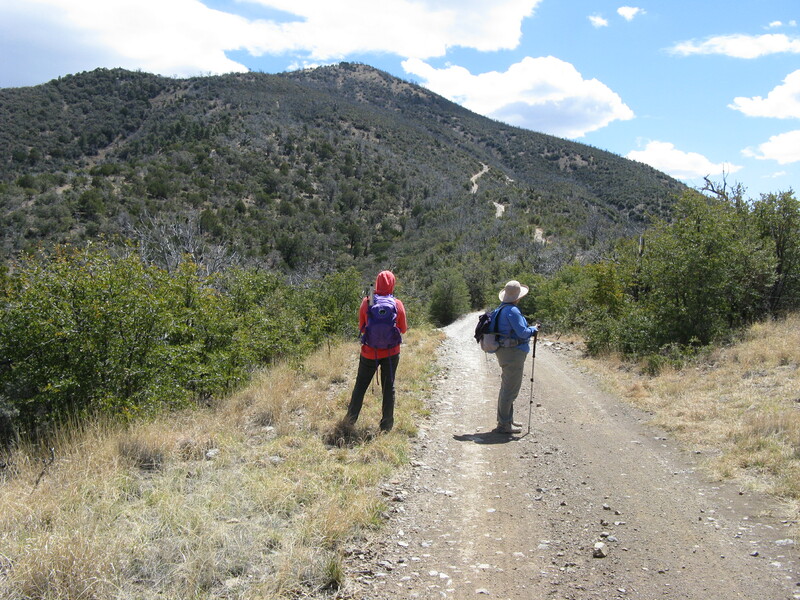 We set a good pace down the mountain toward our turnoff point, descending first through pines, then through oaks and junipers. 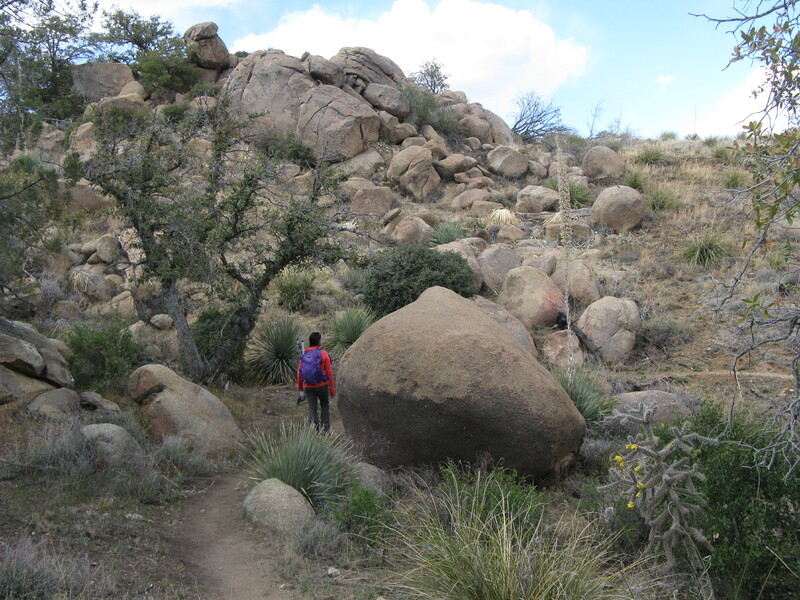 The trail rounded the rocky promontory I’d taken a long break at during my hike of the Palisades Trail to Prison Camp in 2011. 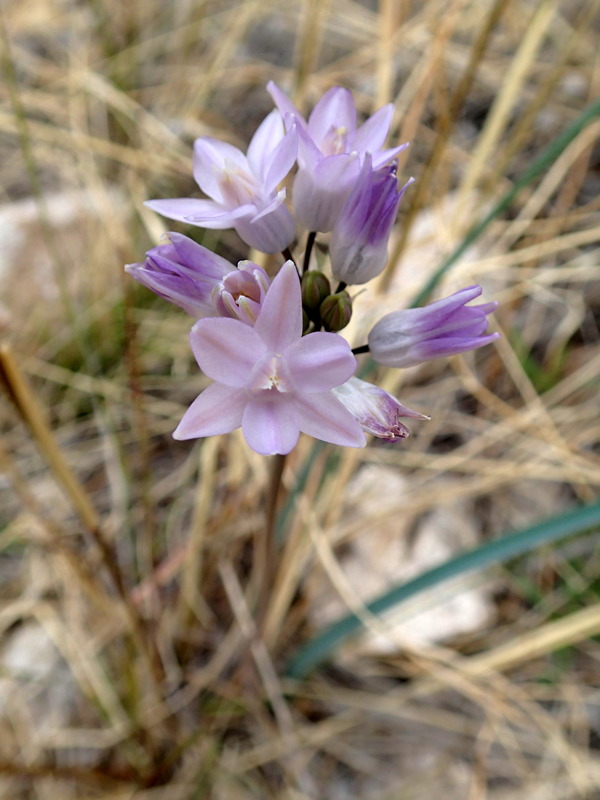 Soon after the trail switchbacked down through the grasses, we reached our turnoff and took a gully into the creekbed. There were some ledges for us to get into our wetsuits, I wore a 3/2 full and was glad I did- made the time spent in the water enjoyable rather than merely tolerable. We had a short hike to the first 150 ft. rappel. Russ went down first so he could provide a fireman’s belay from below. He whistled that he was off rope and it was my turn. I rigged my belay device, double-checked everything, took a deep breath and started lowering myself down the slippery first drop into a pool. Sliding down on my side made the slick rock manageable. 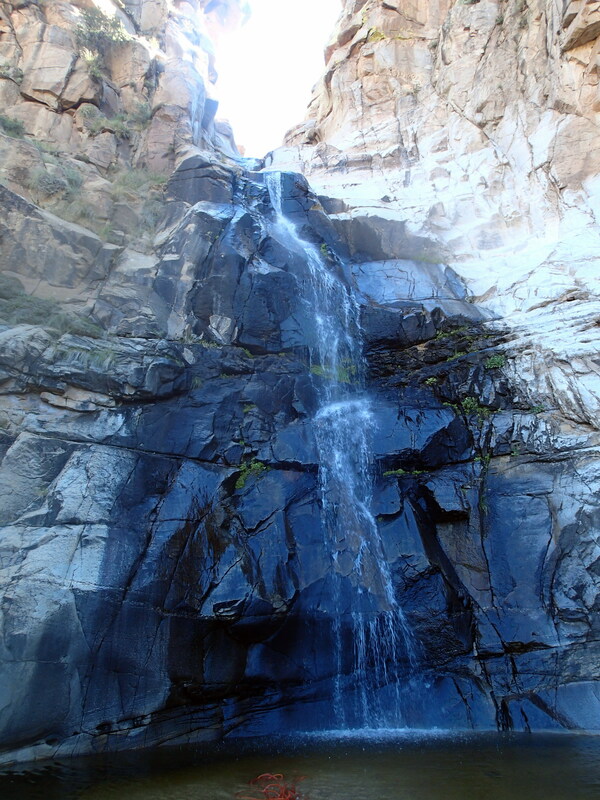 The second part of the rappel was down a waterfall black with slippery algae. I made my way down to the pool below and then we were at the top of the second rappel, the one that had captured my imagination years ago. The second rappel has a chute that diverts the flow into a sideways spigot. I scooted down the chute on my side and stood with the water shooting sideways across the slot. I stopped a second to take it all in- here I was at last! 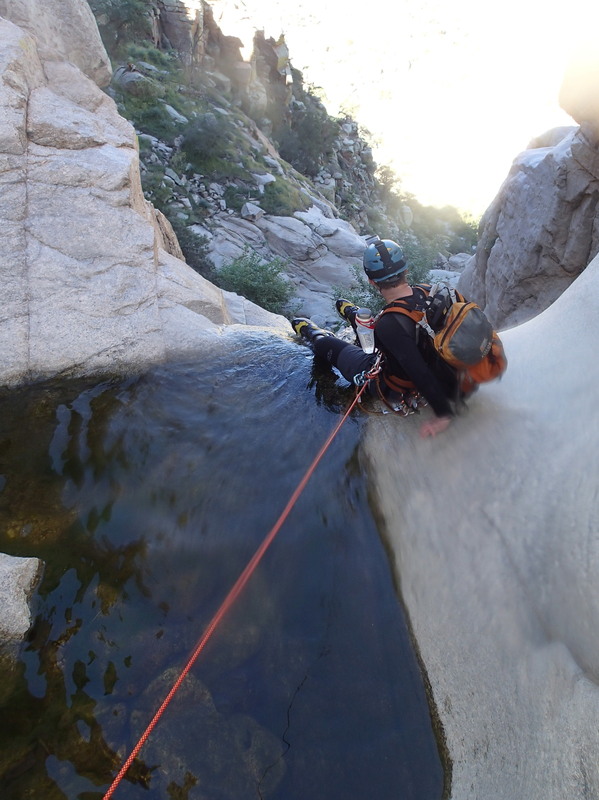 I continued down the rest of the rappel to an immense circular black pool. 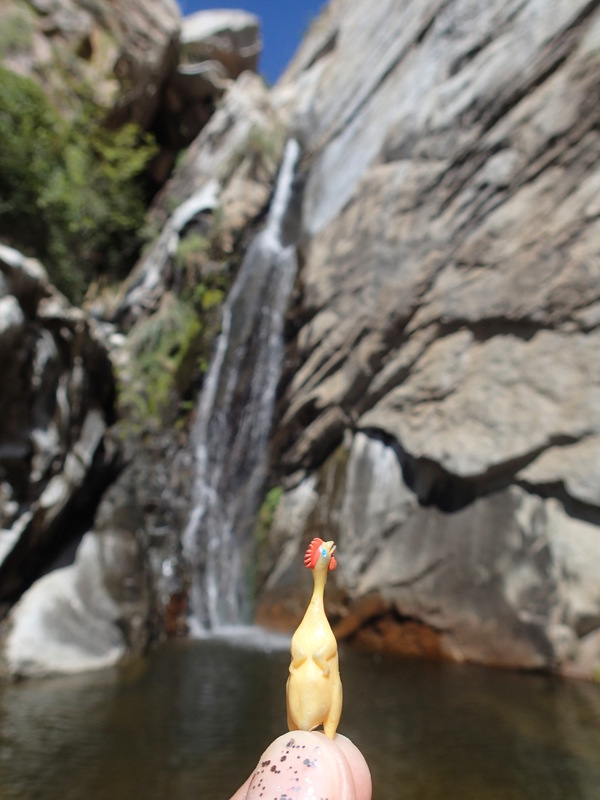 My drybag buoyed me up in the water and I took a bit to happily float around in the pool, looking up at the waterfall- It’s one of my favorite things in the world to do! Immediately afterwards, we had another 85 foot rappel followed by yet another 100 footer. There was a small downclimb and my foot slipped and I came down on my knee. It hurt a bit, but didn’t cause any problems the rest of the day. We were able to look at the cascades above that we had just descended. Incredible. Any one of these falls would be a worthy destination in and of itself. We checked the time, surprised that it was still so early. 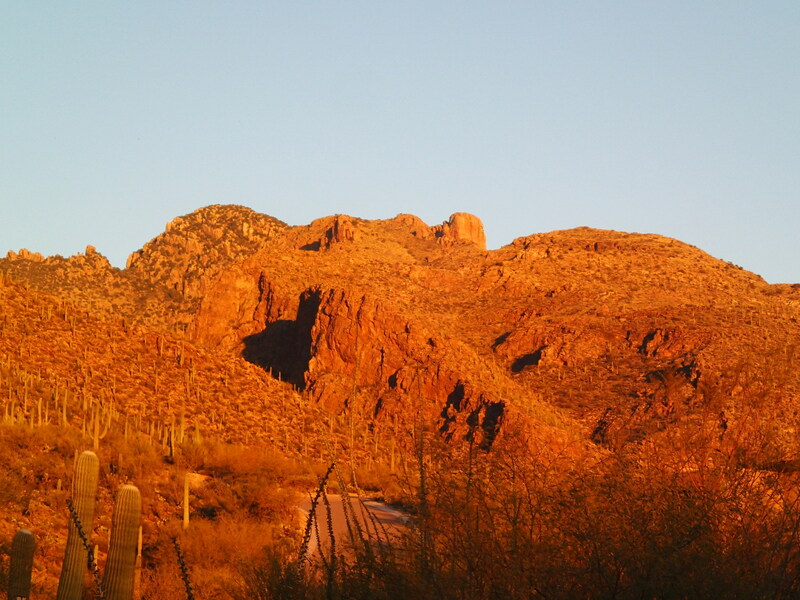 If we got done early enough, we just might be able to catch the Sabino Canyon Tram for the last 4 miles instead of a hot, crowded roadwalk at the end of our day. Russ set up the fifth rappel and as I descended, the water splashing off my helmet made rainbows all around me. What a treat! 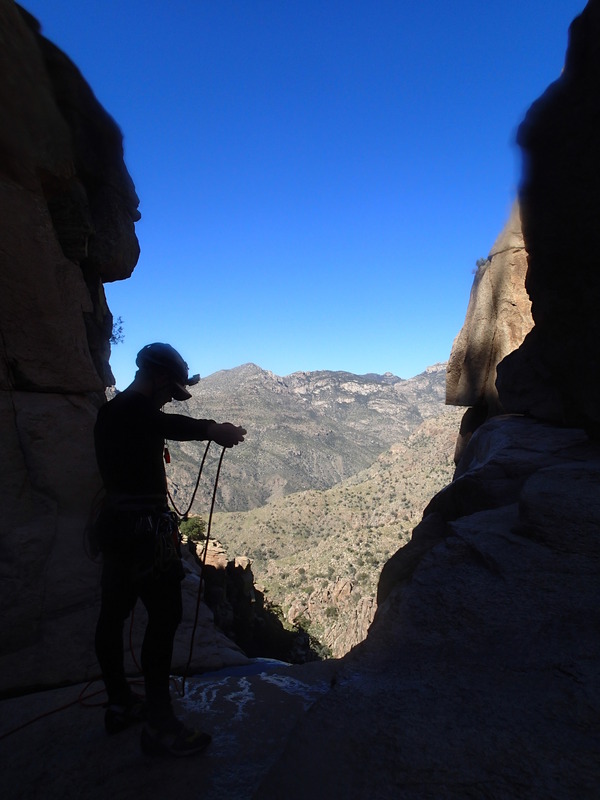 We packed up the ropes and rock-hopped toward our next rappel, two stages measuring 160 feet. The view from the top was fantastic. It took a little maneuvering to get down the first part, then yet another stunning slippery waterfall. There was one last challenge before the technical section was complete- the last 85 footer had a notorious reputation for sticking ropes. Russ found a small stick and wedged it in the rope-eating crack. He went first and I followed. 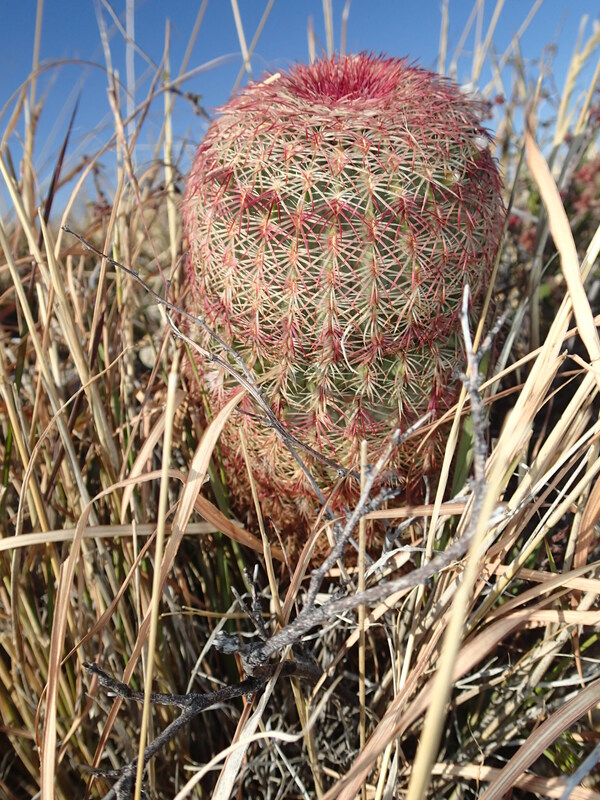 There was an overhang, then a free rappel for a moment underneath a chockstone with a hedgehog cactus clinging to life, dangling precariously by its roots. 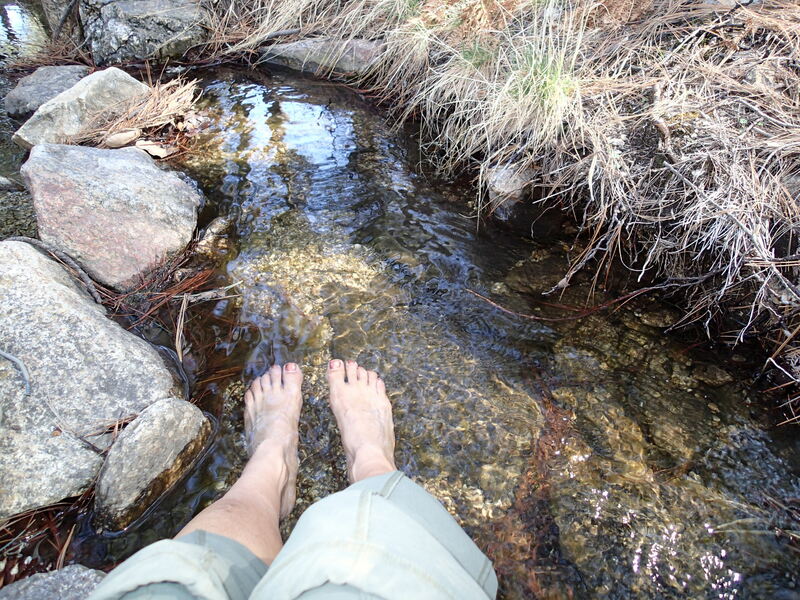 A short stop on a ledge with a tree, then down the rest of the way, rejoining the watercourse into a pool. And now, the moment of truth- Russ and I looked at each other, took a deep breath and pulled as fast as we could, whooping with joy when we realized it was a clean pull- no stuck ropes today! We high-fived and then took a break to refuel and change out of our gear, our concern now was trying to stay cool instead of warm. After eating and repacking all our soggy gear and ropes, we scrambled down Palisades Canyon, dunking ourselves to stay cool. 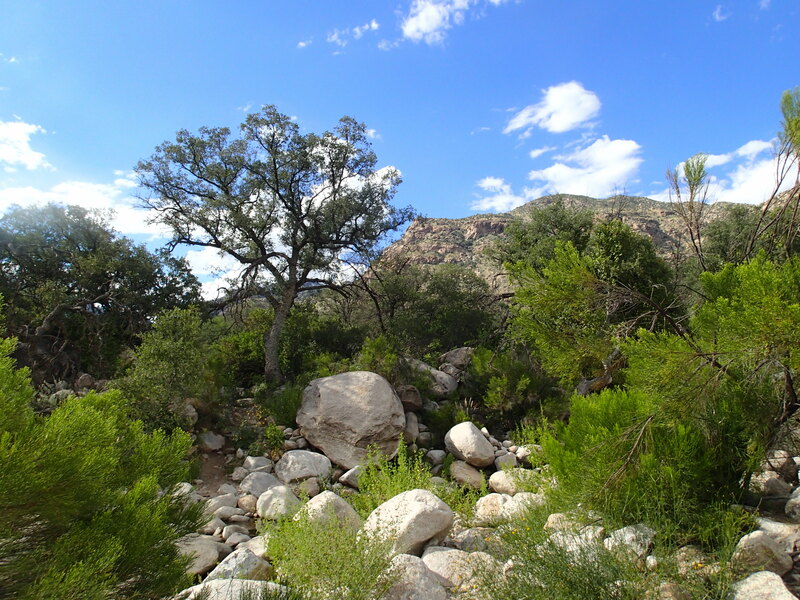 The Sabino Basin got ever closer and finally we hit the East Fork Trail. 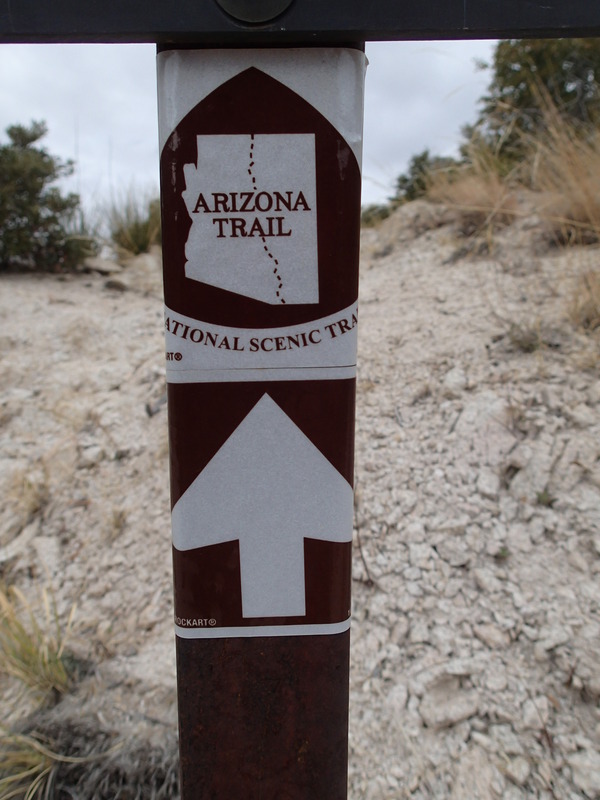 Hello, Arizona Trail! 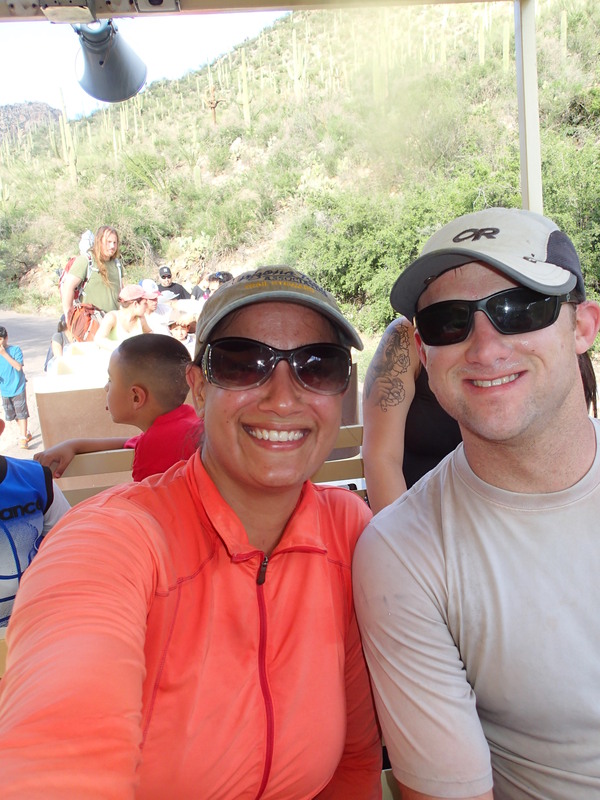 After a quick break to put away our helmets and grab some calories, we checked the time and realized that we could make the tram if we kept a good pace, so we booked it up the Sabino Canyon trail. Not sure where I got all that energy, but the idea of a long hot roadwalk certainly was a great motivator. At 4:30 we saw the tram below and ran to catch it, thinking it was the last one. It was the second to last one of the day, I was just happy that we were riding the road instead of hiking it. 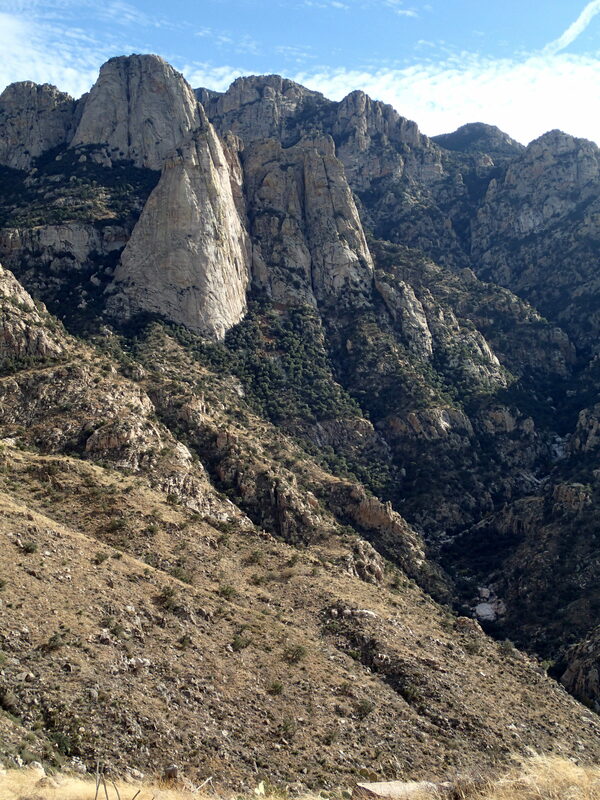 Interestingly, we sat right behind a group of guys who’d just come down Lemmon Canyon for the last two days. We shared canyoneering stories all the way to the parking lot. The sweaty run to catch the tram was all worth it! I had a post-adventure endorphin-induced giant grin on my face as I drove home. Everything went smoothly in the canyon and the next day I was going to leave on an Arizona Trail business trip up to the North Rim and Flagstaff for a week. I walked in the door, eager to share my day with my husband Brian when I was met with news that my dog Zeus was not doing well. He’s a big dog- half German Shepard and half Wolf- and at 15 1/2, this was not a great surprise. But something in Brian’s face told me that it wasn’t just the ordinary old-dog stuff. My mood went instantly from elation to despair- it finally hit home that Zeus wasn’t going to be around much longer. I stayed home for two days and he seemed to stabilize, but when I left on my trip he went downhill again. I spent the last week at home, getting in a last bit of quality time with him- massaging his tired old body, thinking about all the adventures we’d had together, and feeding him anything he wanted to eat. We took Zeus and our other dog, Bailey on one last hike in the desert. As we walked, the dogs turned off toward a labyrinth I’d forgotten was there. I thought Zeus would just wander around and get tired and go back to the car. 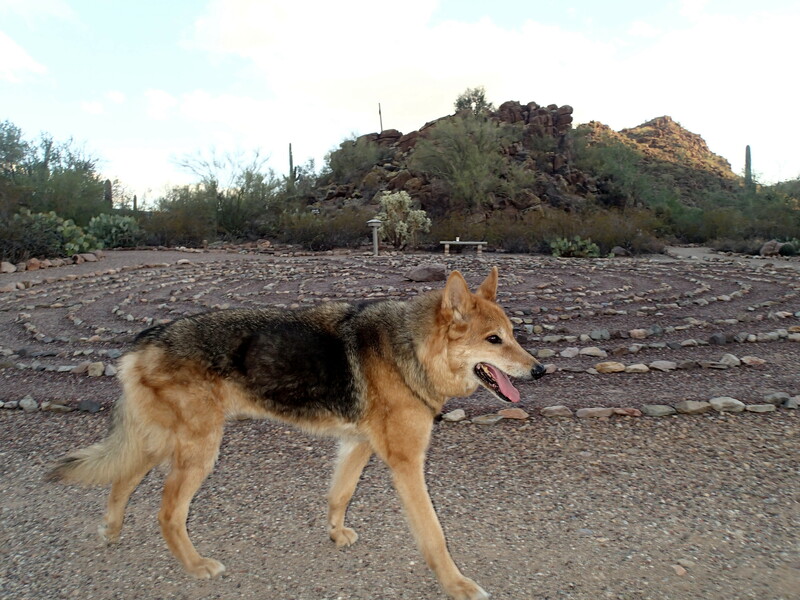 Instead he got a burst of energy and we had a great time hiking into the wash near some petroglyphs. Zeus was a big part of me getting into hiking, I’ll have to write about it sometime. Brian and I made arrangements for a vet to come to the house so that he didn’t have to get all riled up on the drive. It was a wonderful decision. We were all on the futon together, hugging Zeus as his heart finally stopped. We buried him out in Picture Rocks on a friend’s land- he’s got a great resting spot in the desert with a view of the mountains. I don’t know when I’ve ever been so heartbroken. 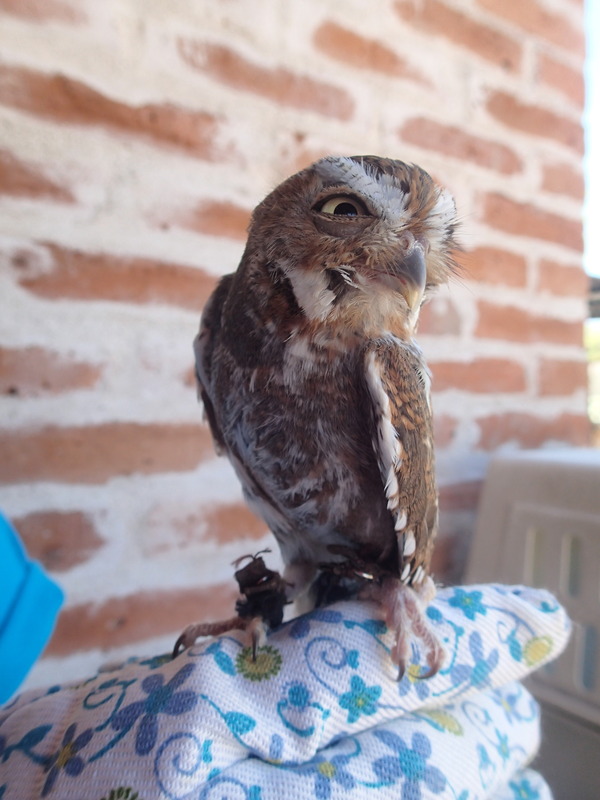 One way I’m dealing with the loss of Zeus is to volunteer a bunch at Wildlife Rehabilitation Northwest Tucson. I took off a bunch of time this summer because I was really busy with my river schedule and it’s good to be back. Fortunately, I managed to sneak a couple of shifts in between trips this summer and meet the myriad youngsters we had in residence. This video of a trio of “Fuzzballs”- baby Great Horned Owls- cracked me up all summer long.